Technology, biology, economic institutions, and people’s preferences are all important determinants of economic outcomes. Power is the ability to do and get the things we want in opposition to the intentions of others. Interactions between economic actors can result in mutual gains, but also in conflicts over how the gains are distributed. Institutions influence the power and other bargaining advantages of actors. The criteria of efficiency and fairness can help evaluate economic institutions and the outcomes of economic interactions. No person to Game at Cards or Dice for Money. The Musicians to have Rest on the Sabbath Day but the other six Days and Nights none without special Favour. The Royal Rover and its Articles were not unusual. During the heyday of European piracy in the late seventeenth and early eighteenth centuries, most pirate ships had written constitutions that guaranteed even more powers to the crew members. Their captains were democratically elected (‘the Rank of Captain being obtained by the Suffrage of the Majority’). Many captains were also voted out, at least one for cowardice in battle. Crews also elected one of their number as the quartermaster who, when the ship was not in a battle, could countermand the captain’s orders. If your ancestor had served as a lookout and had been the first to spot a ship that was later taken as a prize, he would have received as a reward ‘the best Pair of Pistols on board, over and above his Dividend’. Were he to have been seriously wounded in battle, the articles guaranteed him compensation for the injury (more for the loss of a right arm or leg than for the left). He would have worked as part of a multiracial, multi-ethnic crew of which probably about a quarter were of African origin, and the rest primarily of European descent, including Americans. The result was that a pirate crew was often a close-knit group. A contemporary observer lamented that the pirates were ‘wickedly united, and articled together’. Sailors of captured merchant ships often happily joined the ‘roguish Commonwealth’ of their pirate captors. Another unhappy commentator remarked: ‘These Men whom we term … the Scandal of human Nature, who were abandoned to all Vice … were strictly just among themselves.’ If they were Responders in the ultimatum game (explained in Unit 4, Section 4.10), by this description they would have rejected any offer less than half of the pie! Nowhere else in the world during the late seventeenth and early eighteenth century did ordinary workers have the right to vote, to receive compensation for occupational injuries, or to be protected from the kinds of checks on arbitrary authority that were taken for granted on the Royal Rover. The Royal Rover’s articles laid down in black and white the understandings among the pirates about their working conditions. They determined who did what aboard the ship and what each person would get. For example, the size of the helmsman’s dividend compared to that of the gunner. There were also unwritten informal rules of appropriate behaviour that the pirates followed by custom, or to avoid condemnation by their crewmates. These rules, both written and unwritten, were the institutions that governed the interactions among the crew members of the Royal Rover. The institutions provided both the constraints (no drinking after 8 p.m. unless on deck) and the incentives (the best pair of pistols for the lookout who spotted a ship that was later taken). In the terminology of game theory from the previous unit, we could say that they were the ‘rules of the game’, specifying, as in the ultimatum game in Section 4.10, who can do what, when they can do it, and how the players’ actions determine their payoffs. In this unit, we use the terms ‘institutions’ and ‘rules of the game’ interchangeably. For example, in the ultimatum game the rules (institutions) specify the size of the pie, who gets to be the Proposer, what the Proposer can do (offer any fraction of the pie), what the Responder can do (accept or refuse), and who gets what as a result. We also saw that changing the rules of the game changes the outcome. In particular, when there are two Responders in the ultimatum game, they are more likely to accept lower offers because each is not sure what the other will do. And this means that the Proposer can make a lower offer, and obtain a higher payoff. Since institutions determine who can do what, and how payoffs are distributed, they determine the power individuals have to get what they want in interactions with others. The ability to do and get the things we want in opposition to the intentions of others. It may set the terms of an exchange: By making a take-it-or-leave-it offer (as in the ultimatum game). It may impose or threaten to impose heavy costs: Unless the other party acts in a way that benefits the person with power. The rules of the ultimatum game determine the ability that the players have to obtain a high payoff—the extent of their advantage when dividing the pie—which is a form of power called bargaining power. The power to make a take-it-or-leave-it offer gives the Proposer more bargaining power than the Responder, and usually results in the Proposer getting more than half of the pie. Still, the Proposer’s bargaining power is limited because the Responder has the power to refuse. If there are two Responders, the power to refuse is weaker, so the Proposer’s bargaining power is increased. In experiments the assignment of the role Proposer or Responder, and hence the assignment of bargaining power, is usually done by chance. In real economies, the assignment of power is definitely not random. In the labour market, the power to set the terms of the exchange typically lies with those who own the factory or business: they are the ones proposing the wage and other terms of employment. Those seeking employment are like Responders, and since usually more than one person is applying for the same job, their bargaining power may be low, just as in the ultimatum game with more than one Responder. Also, because the place of employment is the employer’s private property, the employer may be able to exclude the worker by firing her unless her work is up to the specifications of the employer. Remember from Units 1 and 2 that the productivity of labour started to increase in Britain around the middle of the seventeenth century. But it was not until the middle of the nineteenth century that a combination of shifts in the supply and demand for labour, and new institutions such as trade unions and the right to vote for workers, gave wage earners the bargaining power to raise wages substantially. We will see in the next unit how the labour market, along with other institutions, gives both kinds of power to employers. In Unit 7 we explain how some firms have the power to set high prices for their products, and in Unit 10, how the credit market gives power to banks and other lenders over people seeking mortgages and loans. Suppose we allow a Proposer simply to divide up a pie in any way, without any role for the Responder other than to take whatever he gets (if anything). Under these rules, the Proposer has all the bargaining power and the Responder none. There is an experimental game like this, and it is called (you guessed it) the dictator game. There are many past and present examples of economic institutions that are like the dictator game, in which there is no option to say no. Examples include today’s remaining political dictatorships, such as The Democratic People’s Republic of Korea (North Korea), and slavery, as it existed in the US prior to the end of the American Civil War in 1865. Criminal organizations involved in drugs and human trafficking would be another modern example, in which power may take the form of physical coercion or threats of violence. In a capitalist economy in a democratic society, institutions exist to protect people against violence and coercion, and to ensure that most economic interactions are conducted voluntarily. Later in this unit we study the outcome of an interaction involving coercion, and how it changes with the power to say no. Whether it is fishermen seeking to make a living while not depleting the fish stocks, or farmers maintaining the channels of an irrigation system, or two people dividing up a pie, we want to be able to both describe what happens and to evaluate it—is it better or worse than other potential outcomes? The first involves facts; the second involves values. We call the outcome of an economic interaction an allocation. In the ultimatum game, for example, the allocation describes the proposed division of the pie by the Proposer, whether it was rejected or accepted, and the resulting payoffs to the two players. According to the Pareto criterion, allocation A dominates allocation B if at least one party would be better off with A than B, and nobody would be worse off. We say that A Pareto dominates B. Now suppose that we want to compare two possible allocations, A and B, that may result from an economic interaction. Can we say which is better? Suppose we find that everyone involved in the interaction would prefer allocation A. Then most people would agree that A is a better allocation than B. This criterion for judging between A and B is called the Pareto criterion, after Vilfredo Pareto, an Italian economist and sociologist. Note that when we say an allocation makes someone ‘better off’ we mean that they prefer it, which does not necessarily mean they get more money. 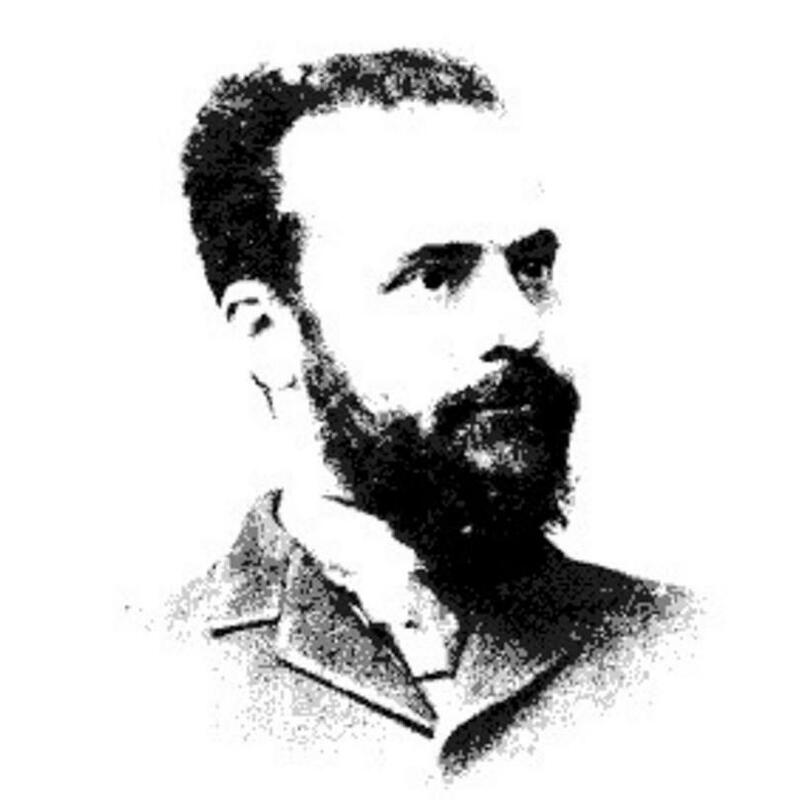 Vilfredo Pareto (1848–1923), an Italian economist and sociologist, earned a degree in engineering for his research on the concept of equilibrium in physics. He is mostly remembered for the concept of efficiency that bears his name. He wanted economics and sociology to be fact-based sciences, similar to the physical sciences that he had studied when he was younger. His empirical investigations led him to question the idea that the distribution of wealth resembles the familiar bell curve, with a few rich and a few poor in the tails of the distribution and a large middle-income class. In its place he proposed what came to be called Pareto’s law, according to which, across the ages and differing types of economy, there were very few rich people and a lot of poor people. His 80–20 rule—derived from Pareto’s law—asserted that the richest 20% of a population typically held 80% of the wealth. Were he living in the US in 2015, he would have to revise that to 90% of the wealth held by the richest 20%, suggesting that his law might not be as universal as he had thought. 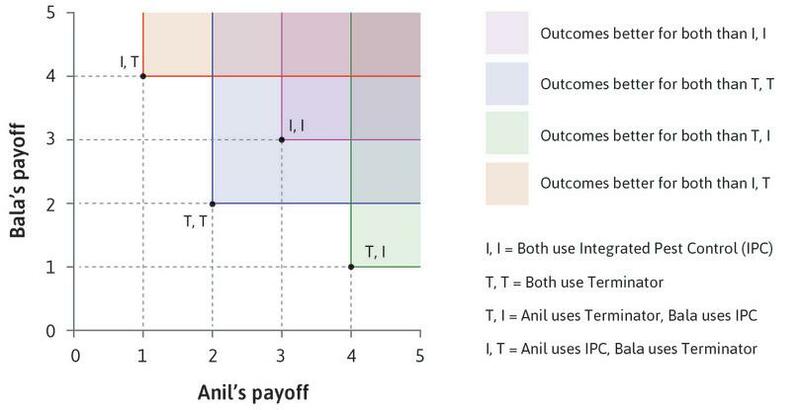 Figure 5.1 compares the four allocations in the pest control game from Unit 4 by the Pareto criterion (using a similar method to the comparison of technologies in Unit 2). We assume that Anil and Bala are self-interested, so they prefer allocations with a higher payoff for themselves. The blue rectangle with its corner at allocation (T, T) shows that (I, I) Pareto dominates (T, T). Follow the steps in Figure 5.1 to see more comparisons. Pareto-efficient allocations. All of the allocations except mutual use of the pesticide (T, T) are Pareto efficient. Figure 5.1 Pareto-efficient allocations. All of the allocations except mutual use of the pesticide (T, T) are Pareto efficient. Figure 5.1a The diagram shows the allocations of the prisoners’ dilemma game played by Anil and Bala. (I, I) lies in the rectangle to the north-east of (T, T), so an outcome where both Anil and Bala use IPC Pareto dominates one where both use Terminator. 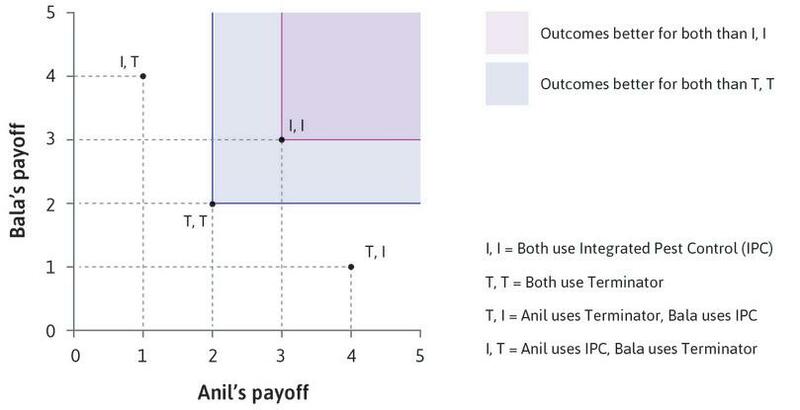 Figure 5.1b (I, I) lies in the rectangle to the north-east of (T, T), so an outcome where both Anil and Bala use IPC Pareto dominates one where both use Terminator. 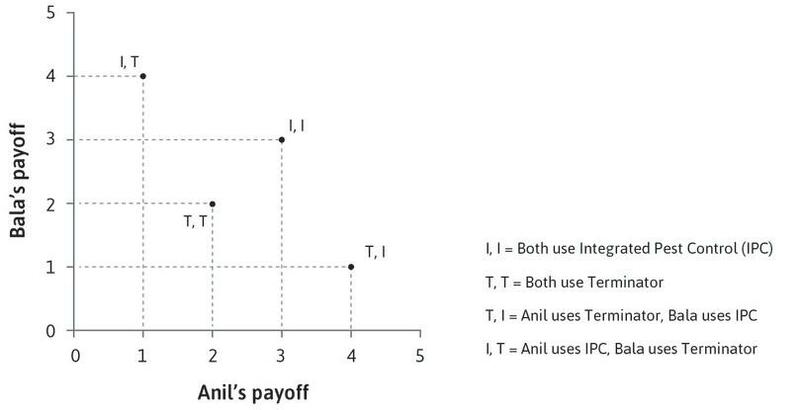 Figure 5.1c If Anil uses Terminator and Bala IPC, then he is better off but Bala is worse off than when both use Terminator. The Pareto criterion cannot say which of these allocations is better. None of the other allocations lie to the north-east of (I, I), so it is not Pareto dominated. Figure 5.1d None of the other allocations lie to the north-east of (I, I), so it is not Pareto dominated. Figure 5.1e Neither of these allocations are Pareto dominated, but they do not dominate any other allocations either. The diagram also shows that three of the four allocations are not Pareto dominated by any other. An allocation with this property is called Pareto efficient. An allocation that is not Pareto dominated by any other allocation is described as Pareto efficient. There is often more than one Pareto-efficient allocation: In the pest-control game there are three. If an allocation is Pareto efficient, this does not mean we should approve of it: Anil playing IPC and Bala free riding by playing Terminator is Pareto efficient, but we (and Anil) may think this is unfair. Pareto efficiency has nothing to do with fairness. Allocation (T, I) is Pareto efficient and (T, T) is not (it is Pareto inefficient): But the Pareto criterion does NOT tell us which is better. There are many Pareto-efficient allocations that we would not evaluate favourably. 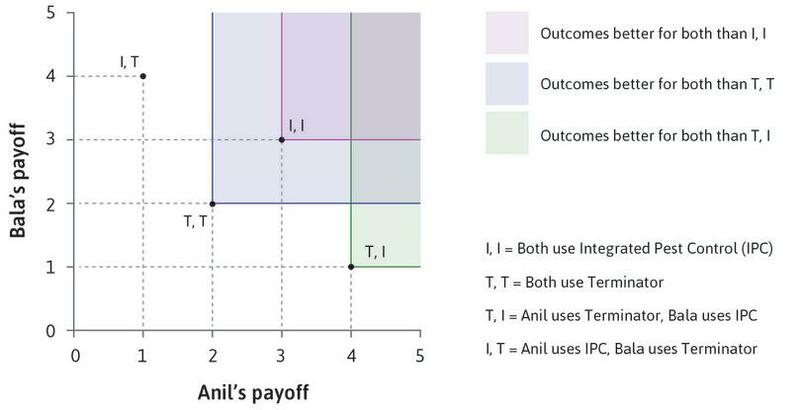 If you look back at Figure 4.5 you can see that any split of Anil’s lottery winnings (including giving Bala nothing) would be Pareto efficient (choose any point on the boundary of the feasible set of outcomes, and draw the rectangle with its corner at that point: there are no feasible points above and to the right). But some of these splits would seem very unfair. Similarly, in the ultimatum game an allocation of one cent to the Responder and $99.99 to the Proposer is also Pareto efficient, because there is no way to make the Responder better off without making the Proposer worse off. The same is true of problems such as the allocation of food. If some people are more than satisfied while others are starving, we might say in everyday language: ‘This is not a sensible way to provide nutrition. It is clearly inefficient.’ But Pareto efficiency means something different. A very unequal distribution of food can be Pareto efficient as long as all the food is eaten by someone who enjoys it even a little. There cannot be more than one Pareto-efficient outcome. According to the Pareto criterion, a Pareto-efficient outcome is always better than an inefficient one. If the allocation is Pareto efficient, there is no allocation that Pareto dominates it: that is, no allocation where someone is better off without others being worse off. It is possible that one of the participants is worse off in the Pareto-efficient outcome, in which case it would not be better by the Pareto criterion. 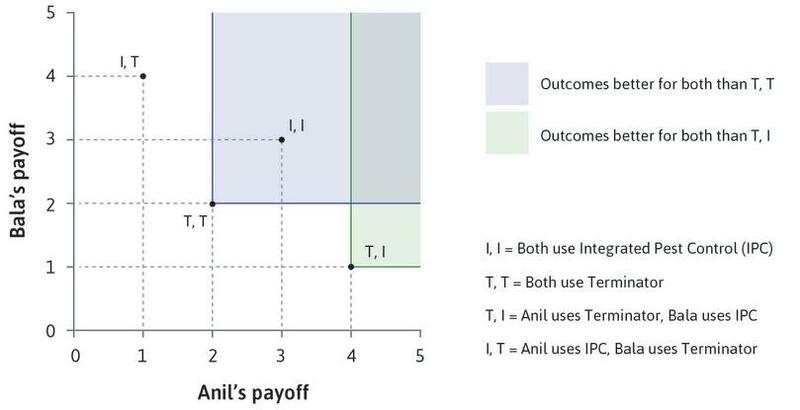 In the pest control game (T, I) is efficient but not better than (T, T). Although the Pareto criterion can help us to evaluate allocations, we will also want to use another criterion: justice. We will ask, is it fair? Suppose, in the ultimatum game, the Proposer offered one cent from a total of $100. As we saw in Unit 4, Responders in experiments around the world typically reject such an offer, apparently judging it to be unfair. Many of us would have a similar reaction if we witnessed two friends, An and Bai, walking down the street. They spot a $100 bill, which An picks up. She offers one cent to her friend Bai, and says she wants to keep the rest. We might be outraged. But we might think differently if we discovered that, though both An and Bai had worked hard all their lives, An had just lost her job and was homeless while Bai was well off. Letting An keep $99.99 might then seem fair. Thus we might apply a different standard of justice to the outcome when we know all of the facts. We could also apply a standard of fairness not to the outcome of the game, but to the rules of the game. Suppose we had observed An proposing an even split, allocating $50 to Bai. Good for An, you say, that seems like a fair outcome. But if this occurred because Bai pulled a gun on An, and threatened that unless she offered an even split she would shoot her, we would probably judge the outcome to be unfair. How unequal they are: In terms of income, for example, or subjective wellbeing. These are substantive judgments of fairness. How they came about: For example by force, or by competition on a level playing field. These are procedural judgements of fairness. Happiness: Economists have developed indicators by which subjective wellbeing can be measured. Freedom: The extent that one can do (or be) what one chooses without socially imposed limits. To make society fairer, would you want greater equality of income, happiness, or freedom? Why? Would there be a trade-off between these aspects? Are there other things that should be more equal to achieve greater fairness in this society? Voluntary exchange of private property acquired by legitimate means: Were the actions resulting in the allocation the result of freely chosen actions by the individuals involved, for example each person buying or selling things that they had come to own through inheritance, purchase, or their own labour? Or was fraud or force involved? Equal opportunity for economic advantage: Did people have an equal oppor­tunity to acquire a large share of the total to be divided up, or were they subjected to some kind of discrimination or other disadvantage because of their race, sexual preference, gender, or who their parents were? Deservingness: Did the rules of the game that determined the allocation take account of the extent to which an individual worked hard, or otherwise upheld social norms? Consider the society in which you live, or another society with which you are familiar. How fair is this society, according to the procedural judge­ments of fairness listed above? The game is played anonymously. Substantive judgements are evaluations of the allocation itself: how the pie is shared. We know from the behaviour of experimental subjects that many people would judge an allocation in which the Proposer took 90% of the pie to be unfair. The rules of the game in the real economy are a long way from the fair procedures of the ultimatum game, and procedural judgements of unfairness are very important to many people, as we will see in Unit 19 (Economic inequality). People’s values about what is fair differ. Some, for example, regard any amount of inequality as fair, as long as the rules of the game are fair. Others judge an allocation to be unfair if some people are seriously deprived of basic needs, while others consume luxuries. We adopt the principle that fairness applies to all people: For example, if we swapped the positions of An and Bai, so that it was Bai instead of An who picked up $100, we would still apply exactly the same standard of justice to evaluate the outcome. From behind the veil of ignorance, we can make a judgement: For example, the choice of a set of institutions—imagining as we do so that we will then become part of the society we have endorsed, with an equal chance of having any of the positions occupied by individuals in that society. in proportion to how many hours each of you has spent selling. Order these alternatives according to your preference and give arguments based on the concepts of fairness introduced in this section. If the order depends on other facts about this joint project, say what other facts you would need. How the dimensions of unfairness may be connected: For example, how the rules of the game that give special advantages to one or another group may affect the degree of inequality. The trade-offs between the dimensions of fairness: For example, do we have to compromise on the equality of income if we also want equality of opportunity? Public policies to address concerns about unfairness: Also, whether these policies compromise other objectives. In the remainder of this unit we explore some economic interactions and evaluate the resulting allocations. As in the experiments in Unit 4, we will see that both cooperation and conflict occur. As in the experiments, and in history, we will find that the rules matter. Initially, Angela works the land on her own, and gets everything she produces. Next, we introduce a second person, who does not farm, but would also like some of the harvest. He is called Bruno. At first, Bruno can force Angela to work for him. In order to survive, she has to do what he says. Later, the rules change: the rule of law replaces the rule of force. Bruno can no longer coerce Angela to work. But he owns the land and if she wants to farm his land, she must agree, for example, to pay him some part of the harvest. Eventually, the rules of the game change again in Angela’s favour. She and her fellow farmers achieve the right to vote and legislation is passed that increases Angela’s claim on the harvest. We can determine objectively whether an outcome is Pareto efficient or not. But whether the outcome is fair depends on your own analysis of the problem, using the concepts of substantive and procedural fairness. As before, Angela’s harvest depends on her hours of work, through the production function. She works the land, and enjoys the remainder of the day as free time. In Unit 3 she consumed the grain that this activity produced. Recall that the slope of the feasible frontier is the marginal rate of transformation (MRT) of free time into grain. Angela values both grain and free time. Again, we represent her preferences as indifference curves, showing the combinations of grain and free time that she values equally. Remember that the slope of the indifference curve is called the marginal rate of substitution (MRS) between grain and free time. 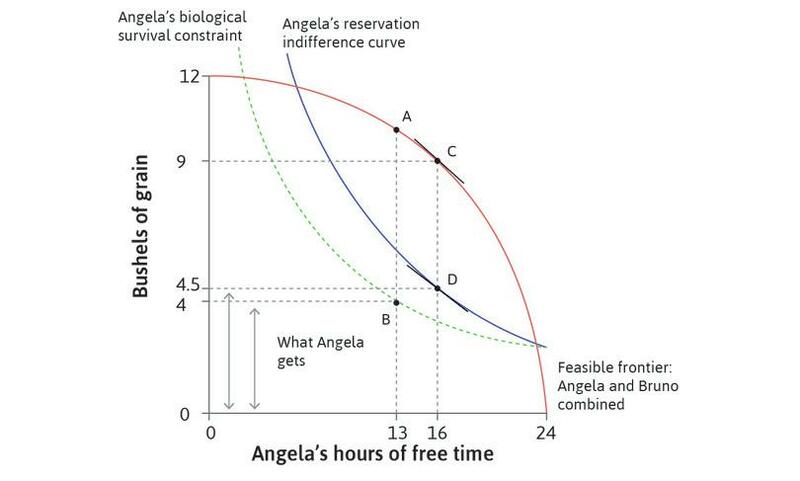 Figure 5.2 shows Angela’s indifference curves and her feasible frontier. The steeper the indifference curve, the more Angela values free time relative to grain. You can see that the more free time she has (moving to the right), the flatter the curves—she values free time less. In this unit, we make a particular assumption (called quasi-linearity) about Angela’s preferences that you can see in the shape of her indifference curves. As she gets more grain, her MRS does not change. So the curves have the same slope as you move up the vertical line at 16 hours of free time. More grain does not change her valuation of free time relative to grain. Why might this be? Perhaps she does not eat it all, but sells some and uses the proceeds to buy other things she needs. This is just a simplification (called quasi-linearity) that makes our model easier to understand. Remember: when drawing indifference curves for the model in this unit, simply shift them up and down, keeping the MRS constant at a given amount of free time. Angela is free to choose her typical hours of work to achieve her preferred combination of free time and grain. Work through Figure 5.2 to determine the allocation. Independent farmer Angela’s feasible frontier, best feasible indifference curve, and choice of hours of work. 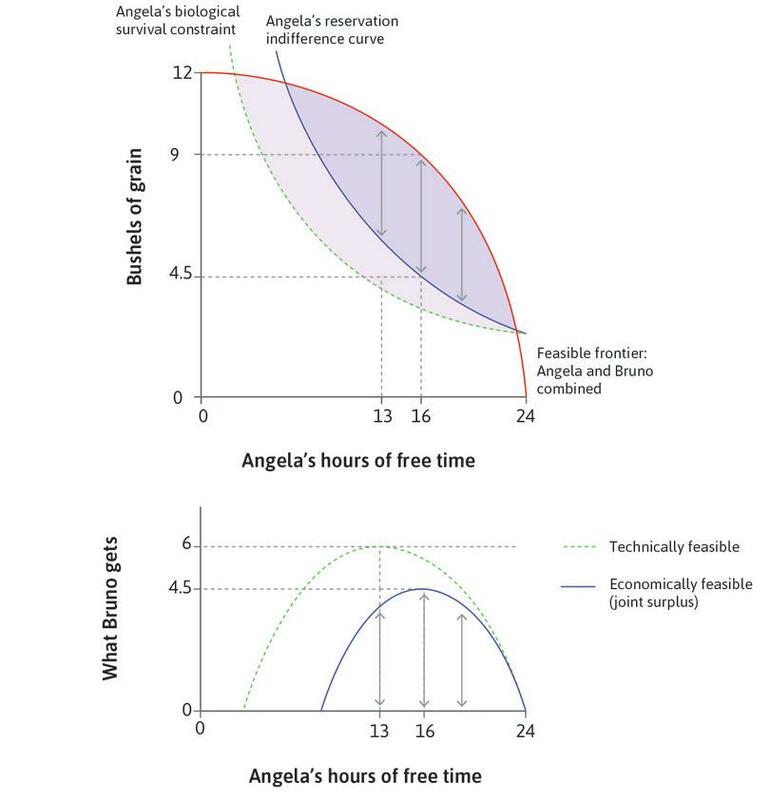 Figure 5.2 Independent farmer Angela’s feasible frontier, best feasible indifference curve, and choice of hours of work. The diagram shows Angela’s feasible frontier, determined by her production function. Figure 5.2a The diagram shows Angela’s feasible frontier, determined by her production function. The best Angela can do, given the limits set by the feasible frontier, is to work for 8 hours, taking 16 hours of free time and producing 9 bushels of grain. At this point C, the marginal rate of substitution (MRS) is equal to the marginal rate of transformation (MRT). 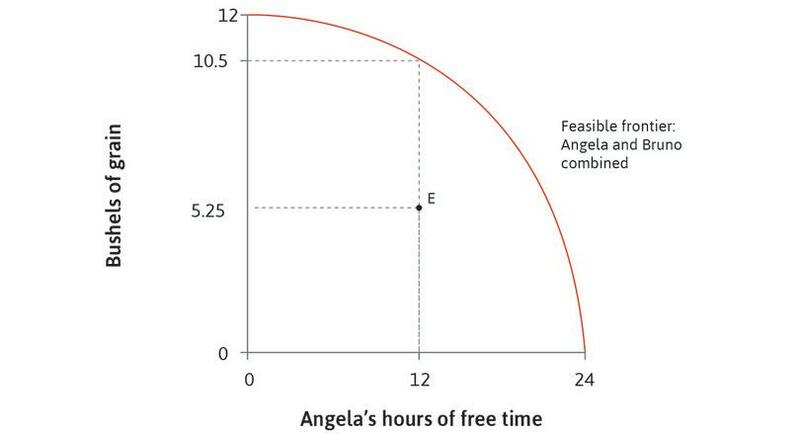 Figure 5.2b The best Angela can do, given the limits set by the feasible frontier, is to work for 8 hours, taking 16 hours of free time and producing 9 bushels of grain. At this point C, the marginal rate of substitution (MRS) is equal to the marginal rate of transformation (MRT). The MRS is the slope of the indifference curve. The trade-off she is willing to make between grain and free time. The MRT is the slope of the feasible frontier: the trade-off she is constrained to make. At point C, the two trade-offs balance. Figure 5.2c The MRS is the slope of the indifference curve. The trade-off she is willing to make between grain and free time. The MRT is the slope of the feasible frontier: the trade-off she is constrained to make. At point C, the two trade-offs balance. But now, Angela has company. The other person is called Bruno; he is not a farmer but will claim some of Angela’s harvest. We will study different rules of the game that explain how much is produced by Angela, and how it is divided between her and Bruno. For example, in one scenario, Bruno is the landowner and Angela pays some grain to him as rent for the use of the land. Figure 5.3 shows Angela and Bruno’s combined feasible frontier. The frontier indicates how many bushels of grain Angela can produce given how much free time she takes. For example, if she takes 12 hours free time and works for 12 hours, then she produces 10.5 bushels of grain. One possible outcome of the interaction between Angela and Bruno is that 5.25 bushels go to Bruno, and Angela retains the other 5.25 bushels for her own consumption. Work through Figure 5.3 to find out how each possible allocation is represented in the diagram, showing how much work Angela did and how much grain she and Bruno each got. Feasible outcomes of the interaction between Angela and Bruno. Figure 5.3 Feasible outcomes of the interaction between Angela and Bruno. The feasible frontier shows the maximum amount of grain available to Angela and Bruno together, given Angela’s amount of free time. If Angela takes 12 hours of free time and works for 12 hours then she produces 10.5 bushels of grain. Figure 5.3a The feasible frontier shows the maximum amount of grain available to Angela and Bruno together, given Angela’s amount of free time. If Angela takes 12 hours of free time and works for 12 hours then she produces 10.5 bushels of grain. Point E is a possible outcome of the interaction between Angela and Bruno. Figure 5.3b Point E is a possible outcome of the interaction between Angela and Bruno. At point E, Angela works for 12 hours and produces 10.5 bushels of grain. The distribution of grain is such that 5.25 bushels go to Bruno and Angela retains the other 5.25 bushels for her own consumption. Figure 5.3c At point E, Angela works for 12 hours and produces 10.5 bushels of grain. The distribution of grain is such that 5.25 bushels go to Bruno and Angela retains the other 5.25 bushels for her own consumption. Point F shows an allocation in which Angela works more than at point E and gets less grain, and point G shows the case in which she works more and gets more grain. Figure 5.3d Point F shows an allocation in which Angela works more than at point E and gets less grain, and point G shows the case in which she works more and gets more grain. An outcome at H—in which Angela works 12 hours a day, Bruno consumes the entire amount produced and Angela consumes nothing—would not be possible: she would starve. Figure 5.3e An outcome at H—in which Angela works 12 hours a day, Bruno consumes the entire amount produced and Angela consumes nothing—would not be possible: she would starve. 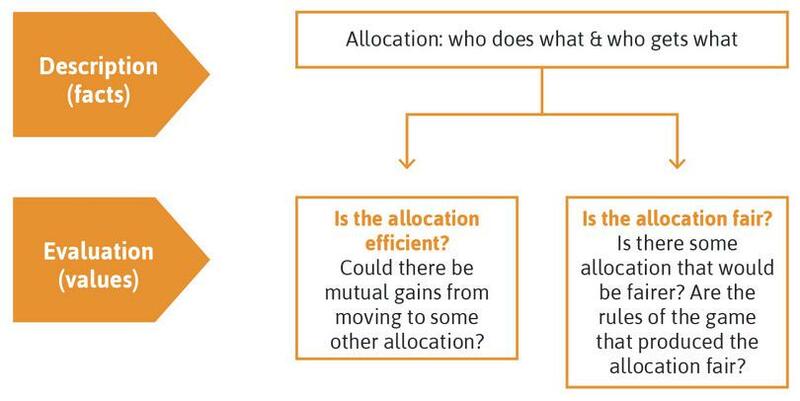 Which allocations are likely to occur? Not all of them are even possible. For example, at point H Angela works 12 hours a day and receives nothing (Bruno takes the entire harvest), so Angela would not survive. Of the allocations that are at least possible, the one that will occur depends on the rules of the game. In Figure 5.3, point F shows an allocation in which Angela works more and gets less than at point E, and point G shows the case in which she works more and gets more. By sketching Angela’s indifference curves, work out what you can say about her preferences between E, F and G, and how this depends on the slope of the curves. Figure 5.3 shows Angela and Bruno’s combined feasible set, and four allocations that might result from an interaction between them. If Angela has very flat indifference curves, she may prefer G to the other three allocations. If Angela has very steep indifference curves, she may prefer F to the other three allocations. Allocation G is the best of the four for Bruno. It is possible that Angela is indifferent between G and E.
Angela’s indifference curves are downward-sloping. If the indifference curve through G was sufficiently flat, the other three points would all lie below it. Whatever the slope of her indifference curves, Angela would prefer E to F, as it gives her more grain and more free time. Bruno gets an amount of grain equal to the vertical distance from the allocation to the feasible frontier. So G is the worst of the four allocations for him. Angela could be indifferent between G and E—one of her indifference curves could pass through both points. Initially Angela could consume (or sell) everything she produced. Now Bruno has arrived, and he has a gun. He has the power to implement any allocation that he chooses. He is even more powerful than the dictator in the dictator game (in which a Proposer dictates how a pie is to be divided). Why? Bruno can determine the size of the pie, as well as how it is shared. Unlike the experimental subjects in Unit 4, in this model Bruno and Angela are entirely self-interested. Bruno wants only to maximize the amount of grain he can get. 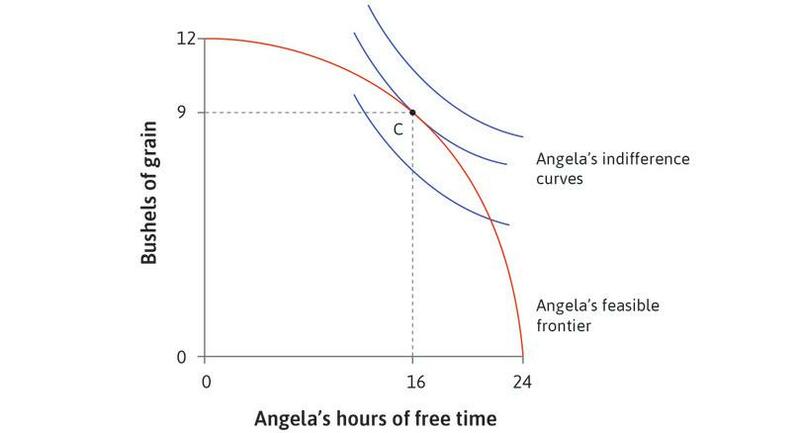 Angela cares only about her own free time and grain (as described by her indifference curves). We now make another important assumption. If Angela does not work the land, Bruno gets nothing (there are no other prospective farmers that he can exploit). What this means is that Bruno’s reservation option (what he gets if Angela does not work for him) is zero. As a result, Bruno thinks about the future: he will not take so much grain that Angela will die. The allocation must keep her alive. First, we will work out the set of technically feasible combinations of Angela’s hours of work and the amount of grain she receives: that is, all the combinations that are possible within the limitations of the technology (the production function) and biology (Angela must have enough nutrition to do the work and survive). Figure 5.4 shows how to find the technically feasible set. We already know that the production function determines the feasible frontier. This is the technological limit on the total amount consumed by Bruno and Angela, which in turn depends on the hours that Angela works. Angela’s biological survival constraint shows the minimum amount of grain that she needs for each amount of work that she does; points below this line would leave her so undernourished or overworked that she would not survive. This constraint shows what is biologically feasible. Notice that if she expends more energy working, she needs more food; that’s why the curve rises from right to left from point Z as her hours of work increase. The slope of the biological survival constraint is the marginal rate of substitution between free time and grain in securing Angela’s survival. The fact that Angela’s survival might be in jeopardy is not a hypothetical example. During the Industrial Revolution, life expectancy at birth in Liverpool, UK, fell to 25 years: slightly more than half of what it is today in the poorest countries in the world. In many parts of the world today, farmers’ and workers’ capacity to do their jobs is limited by their caloric intake. Figure 5.4 Technically feasible allocations. If Angela does not work at all, she needs 2.5 bushels to survive (point Z). If she gives up some free time and expends energy working, she needs more food, so the curve is higher when she has less free time. This is the biological survival constraint. Figure 5.4a If Angela does not work at all, she needs 2.5 bushels to survive (point Z). If she gives up some free time and expends energy working, she needs more food, so the curve is higher when she has less free time. This is the biological survival constraint. Points below the biological survival constraint are biologically infeasible, while points above the feasible frontier are technically infeasible. Figure 5.4b Points below the biological survival constraint are biologically infeasible, while points above the feasible frontier are technically infeasible. Given the feasible frontier, there is a maximum amount of work above which Angela could not survive, even if she could consume everything she produced. Figure 5.4c Given the feasible frontier, there is a maximum amount of work above which Angela could not survive, even if she could consume everything she produced. The technically feasible allocations are the points in the lens-shaped area bounded by the feasible frontier and the biological survival constraint (including points on the frontier). Figure 5.4d The technically feasible allocations are the points in the lens-shaped area bounded by the feasible frontier and the biological survival constraint (including points on the frontier). Note that there is a maximum amount of work that would allow her barely to survive (because of the calories she burns up working). As we saw in Unit 2, throughout human history people crossed the survival threshold when the population outran the food supply. This is the logic of the Malthusian population trap. The productivity of labour placed a limit on how large the population could be. the availability to Angela of a better designed hoe making it physically easier to do the work of farming. In Angela’s case, it is not only the limited productivity of her labour that might jeopardize her survival, but also how much of what she produces is taken by Bruno. 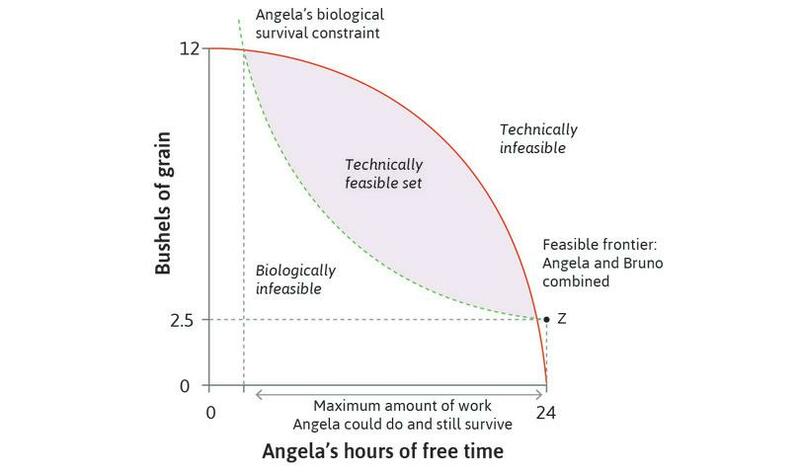 If Angela could consume everything she produced (the height of the feasible frontier) and choose her hours of work, her survival would not be in jeopardy since the biological survival constraint is below the feasible frontier for a wide range of working hours. The question of biological feasibility arises because of Bruno’s claims on her output. In Figure 5.4, the boundaries of the feasible solutions to the allocation problem are formed by the feasible frontier and the biological survival constraint. This lens-shaped shaded area gives the technically possible outcomes. We can now ask what will actually happen—which allocation will occur, and how does this depend on the institutions governing Bruno’s and Angela’s interaction? 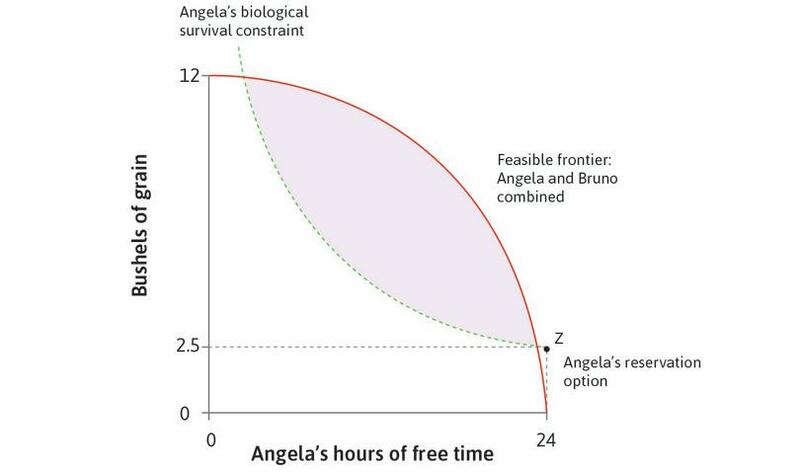 Figure 5.4 shows Angela and Bruno’s feasible frontier, and Angela’s biological survival constraint. Based on this figure, which of the following is correct? If Angela works 24 hours she can survive. There is a technically feasible allocation in which Angela does not work. A new technology that boosted grain production would result in a bigger technically feasible set. If Angela did not need so much grain to survive the technically feasible set would be smaller. At 24 hours of work (or 0 hours of free time), Angela’s biological survival constraint is above the feasible frontier. This means that at this point she cannot produce enough grain to survive. Angela would not produce any grain if she did not work. This is not technically feasible because she needs 2.5 bushels of grain to survive. Technology that boosted grain production would increase the amount of grain that could be produced for any given number of working hours, shifting the feasible frontier up and thus expanding the technically feasible set. 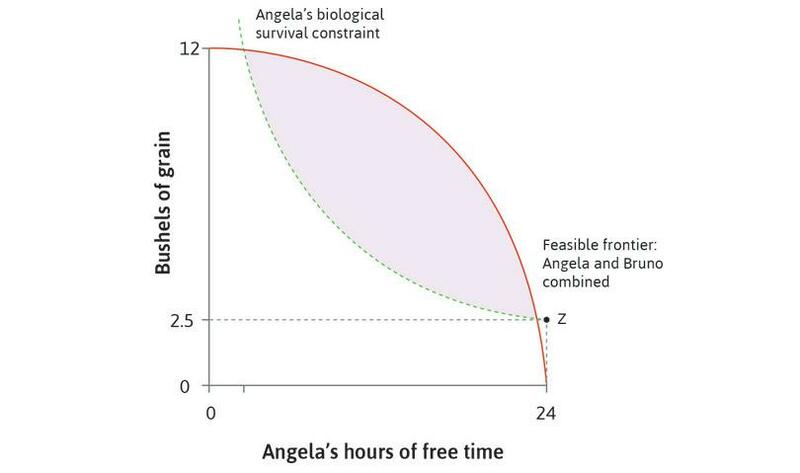 If Angela did not need as much grain to survive, the biological survival constraint would be lower, making the technically feasible set bigger. With the help of his gun, Bruno can choose any point in the lens-shaped technically feasible set of allocations. But which will he choose? For any number of hours that I order Angela to work, she will produce the amount of grain shown by the feasible frontier. But I’ll have to give her at least the amount shown by the biological survival constraint for that much work, so that I can continue to exploit her. I get to keep the difference between what she produces and what I give her. Therefore I should find the hours of Angela’s work for which the vertical distance between the feasible frontier and the biological survival constraint (Figure 5.5) is the greatest. The amount that Bruno will get if he implements this strategy is his economic rent, meaning the amount he gets over what he would get if Angela were not his slave (which, in this model, we set at zero). Bruno first considers letting Angela continue to work 8 hours a day, producing 9 bushels, as she did when she had free access to the land. For 8 hours of work she needs 3.5 bushels of grain to survive. So Bruno could take 5.5 bushels without jeopardizing his future opportunities to benefit from Angela’s labour. Bruno, your plan cannot be right. If you forced her to work a little more, she’d only need a little more grain to have the energy to work longer, because the biological survival constraint is relatively flat at 8 hours of work. But the feasible frontier is steep, so she would produce a lot more if you imposed longer hours. You demonstrate the argument to him using the analysis in Figure 5.5, which indicates that the vertical distance between the feasible frontier and the biological survival constraint is the greatest when Angela works for 11 hours. If Bruno commands Angela to work for 11 hours, then she will produce 10 bushels and Bruno will get to keep 6 bushels for himself. We can use Figure 5.5 to find out how many bushels of grain Bruno will get for any technically feasible allocation. Coercion: The maximum technically feasible transfer from Angela to Bruno. Figure 5.5 Coercion: The maximum technically feasible transfer from Angela to Bruno. Bruno can choose any allocation in the technically feasible set. He considers letting Angela continue working 8 hours a day, producing 9 bushels. Figure 5.5a Bruno can choose any allocation in the technically feasible set. He considers letting Angela continue working 8 hours a day, producing 9 bushels. Bruno could take 5.5 bushels without jeopardizing his future benefit from Angela’s labour. This is shown by the vertical distance between the feasible frontier and the survival constraint. Figure 5.5b Bruno could take 5.5 bushels without jeopardizing his future benefit from Angela’s labour. This is shown by the vertical distance between the feasible frontier and the survival constraint. 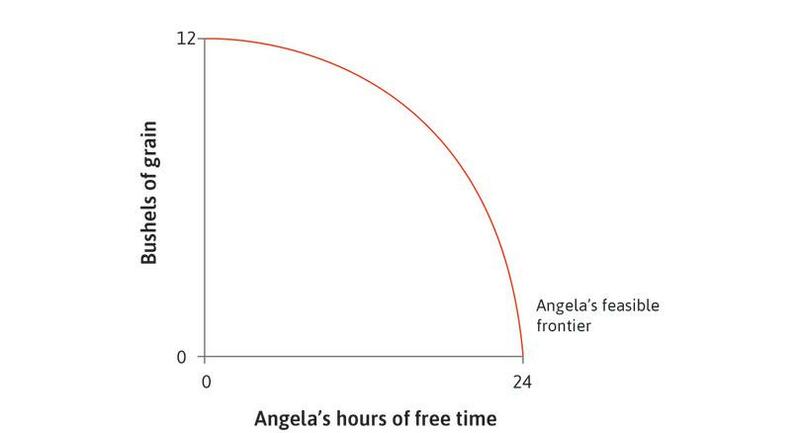 The vertical distance between the feasible frontier and the biological survival constraint is greatest when Angela works for 11 hours (13 hours of free time). 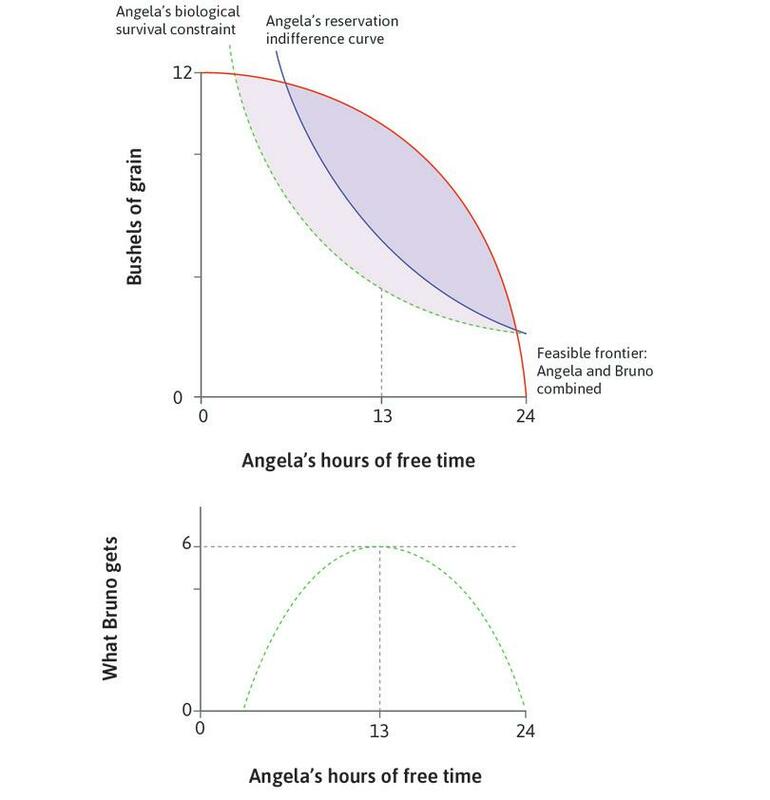 Figure 5.5c The vertical distance between the feasible frontier and the biological survival constraint is greatest when Angela works for 11 hours (13 hours of free time). If Bruno commands Angela to work for 11 hours, she will produce 10 bushels, and needs 4 to survive. Bruno will get to keep 6 bushels for himself (the distance AB). Figure 5.5d If Bruno commands Angela to work for 11 hours, she will produce 10 bushels, and needs 4 to survive. Bruno will get to keep 6 bushels for himself (the distance AB). If Bruno makes Angela work for more than 11 hours, the amount he can take falls as working hours increase. Figure 5.5e If Bruno makes Angela work for more than 11 hours, the amount he can take falls as working hours increase. Bruno gets the maximum amount of grain by choosing allocation B, where Angela’s working time is such that the slope of the feasible frontier is equal to the slope of the biological survival constraint: MRT = MRS. Figure 5.5f Bruno gets the maximum amount of grain by choosing allocation B, where Angela’s working time is such that the slope of the feasible frontier is equal to the slope of the biological survival constraint: MRT = MRS. If we join up the points then we can see that the amount Bruno gets is hump-shaped, and peaks at 11 hours of work (13 hours of free time). Figure 5.5g If we join up the points then we can see that the amount Bruno gets is hump-shaped, and peaks at 11 hours of work (13 hours of free time). The lower panel in the last step in Figure 5.5 shows how the amount Bruno can take varies with Angela’s free time. The graph is hump-shaped, and peaks at 13 hours of free time and 11 hours of work. Bruno maximizes his amount of grain at allocation B, commanding Angela to work for 11 hours. Notice how the slopes of the feasible frontier and the survival constraint (the MRT and MRS) help us to find the number of hours where Bruno can take the maximum amount of grain. To the right of 13 hours of free time (that is, if Angela works less than 11 hours) the biological survival constraint is flatter than the feasible frontier (MRS < MRT). This means that working more hours (moving to the left) would produce more grain than what Angela needs for the extra work. To the left of 13 hours of free time (Angela working more), the reverse is true: MRS > MRT. Bruno’s economic rent is greatest at the hours of work where the slopes of the two frontiers are equal. 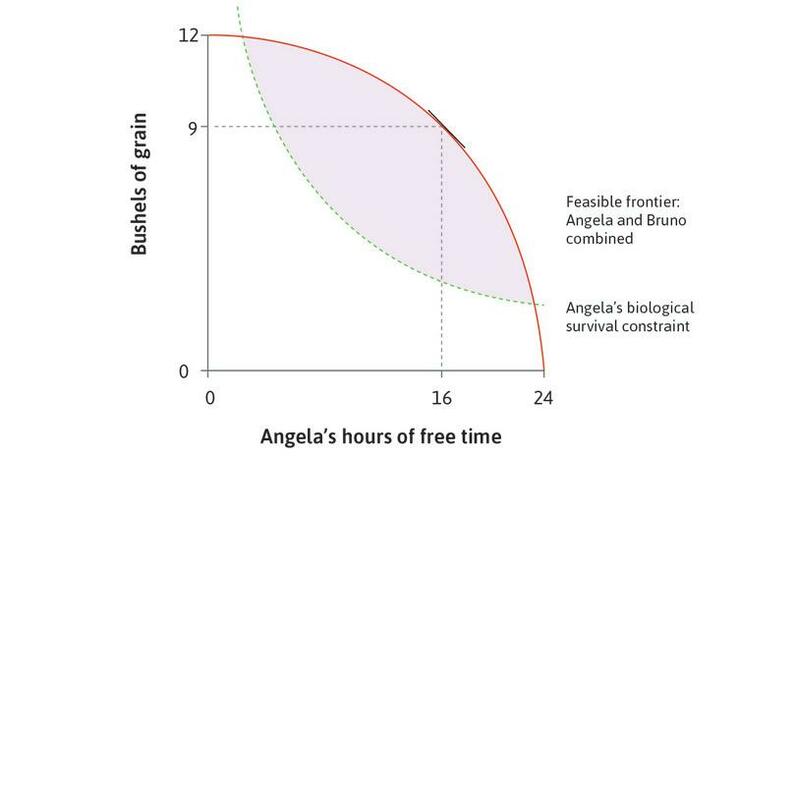 Figure 5.5 shows Angela and Bruno’s feasible frontier, and Angela’s biological survival constraint. He will choose the technically feasible allocation where Angela produces the most grain. His preferred choice will be where the marginal rate of transformation (MRT) on the feasible frontier equals the marginal rate of substitution (MRS) on the biological survival constraint. He will not choose 8 hours of work, because the MRS between Angela’s work hours and subsistence requirements exceeds the MRT between work hours and grain output. He will choose 13 hours of free time for Angela, and consume 10 bushels of grain. At the technically feasible point where Angela produces the most grain, she needs all of the grain to survive, so there would be none for Bruno. The distance between the feasible frontier and Angela’s survival constraint, and thus Bruno’s share, is maximized where MRS = MRT. At 8 hours of work (16 hours of free time) the feasible frontier is steeper than the biological survival constraint. Thus MRT > MRS.
Bruno would indeed choose 13 hours of free time for Angela, but the maximum he can claim without making Angela unable to work is 6 bushels of grain: the vertical distance between the feasible frontier and the survival constraint. The economic interaction described in this section takes place in an environment where Bruno has the power to enslave Angela. 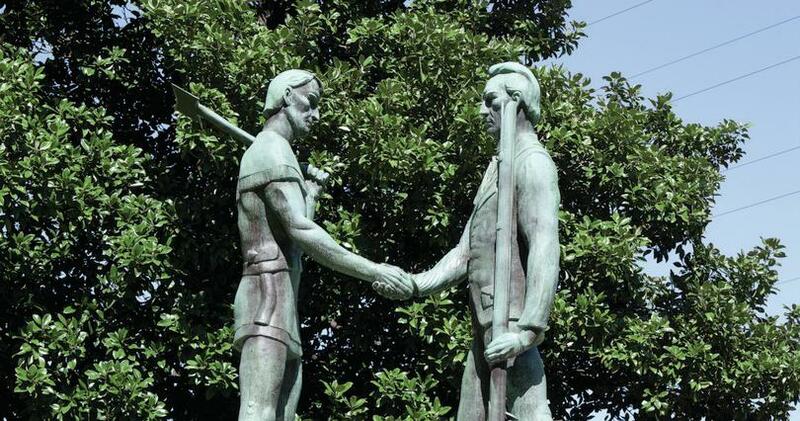 If we move from a scenario of coercion to one in which there is a legal system that prohibits slavery and protects private property and the rights of landowners and workers, we can expect the outcome of the interaction to change. In Unit 1, we defined private property as the right to use and exclude others from the use of something, and the right to sell it (or to transfer these rights to others). From now on we will suppose that Bruno owns the land and can exclude Angela if he chooses. How much grain he will get as a result of his private ownership of the land will depend on the extent of his power over Angela in the new situation. When people participate voluntarily in an interaction, they do so because they expect the outcome to be better than their reservation option—the next-best alternative. In other words, they do so in pursuit of economic rents. Economic rents are also sometimes called gains from exchange, because they are how much a person gains by engaging in the exchange compared to not engaging. The sum of the economic rents is termed the surplus (or sometimes the joint surplus, to emphasize that it includes all of the rents). How much rent they will each get—how they will share the surplus—depends on their bargaining power. And that, as we know, depends on the institutions governing the interaction. In the example above, Angela was forced to participate and Bruno chose her working hours to maximize his own economic rent. Next we look at the situation where she can simply say no. Angela is no longer a slave, but Bruno still has the power to make a take-it-or-leave-it offer, just like the Proposer in the ultimatum game. We check back on Angela and Bruno, and immediately notice that Bruno is now wearing a suit, and is no longer armed. He explains that this is no longer needed because there is now a government with laws administered by courts, and professional enforcers called the police. Bruno now owns the land, and Angela must have permission to use his property. He can offer a contract allowing her to farm the land, and give him part of the harvest in return. But the law requires that exchange is voluntary: Angela can refuse the offer. It used to be a matter of power, but now both Angela and I have property rights: I own the land, and she owns her own labour. The new rules of the game mean that I can no longer force Angela to work. She has to agree to the allocation that I propose. Then there is no deal. She doesn’t work on my land, I get nothing, and she gets barely enough to survive from the government. So you and Angela have the same amount of power? Certainly not! I am the one who gets to make a take-it-or-leave-it offer. I am like the Proposer in the ultimatum game, except that this is no game. If she refuses she goes hungry. But if she refuses you get zero? Why does he know this? Bruno knows that Angela, unlike the subjects in the ultimatum game experiments, is entirely self-interested (she does not punish an unfair offer). If he makes an offer that is just a tiny bit better for Angela than not working at all and getting subsistence rations, she will accept it. In this case, what should my take-it-or-leave-it offer be? You answered before by showing him the biological survival constraint. Now the limitation is not Angela’s survival, but rather her agreement. You know that she values her free time, so the more hours he offers her to work, the more he is going to have to pay. Why don’t you just look at Angela’s indifference curve that passes through the point where she does not work at all and barely survives? That will tell you how much is the least you can pay her for each of the hours of free time she would give up to work for you. Point Z in Figure 5.6 is the allocation in which Angela does no work and gets only survival rations (from the government, or perhaps her family). This is her reservation option: if she refuses Bruno’s offer, she has this option as a backup. Follow the steps in Figure 5.6 to see Angela’s reservation indifference curve: all of the allocations that have the same value for her as the reservation option. Below or to the left of the curve she is worse off than in her reservation option. Above and to the right she is better off. Economically feasible allocations when exchange is voluntary. 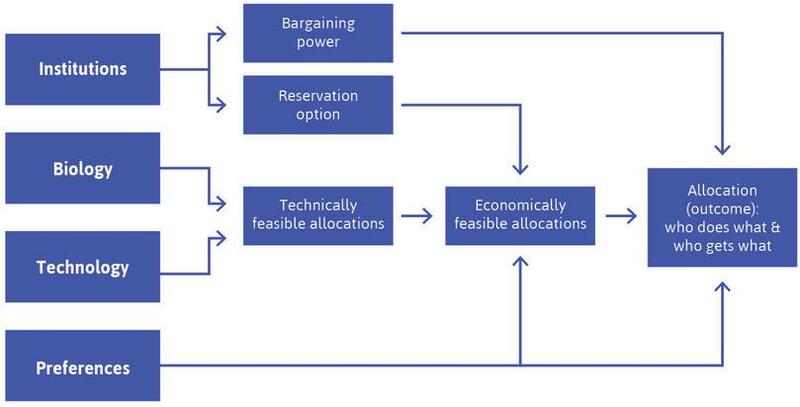 Figure 5.6 Economically feasible allocations when exchange is voluntary. Point Z, the allocation in which Angela does not work and gets only survival rations from the government, is called her reservation option. 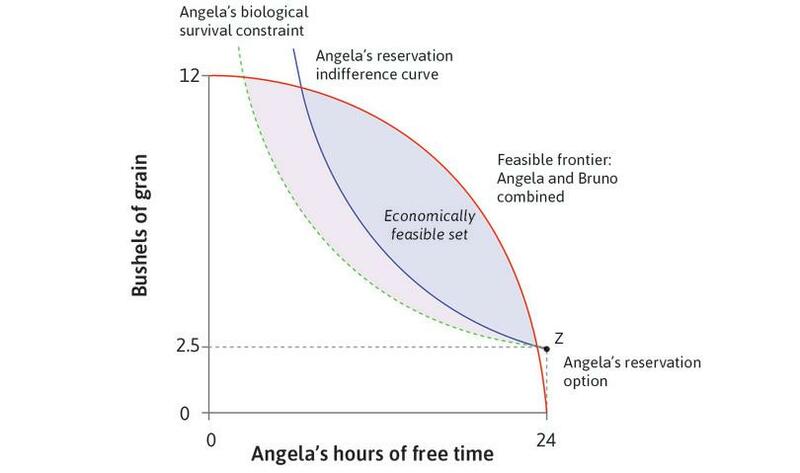 Figure 5.6a Point Z, the allocation in which Angela does not work and gets only survival rations from the government, is called her reservation option. The curve showing all of the allocations that are just as highly valued by Angela as the reservation option is called her reservation indifference curve. Figure 5.6b The curve showing all of the allocations that are just as highly valued by Angela as the reservation option is called her reservation indifference curve. The points in the area bounded by the reservation indifference curve and the feasible frontier (including the points on the frontiers) define the set of all economically feasible allocations. Figure 5.6c The points in the area bounded by the reservation indifference curve and the feasible frontier (including the points on the frontiers) define the set of all economically feasible allocations. 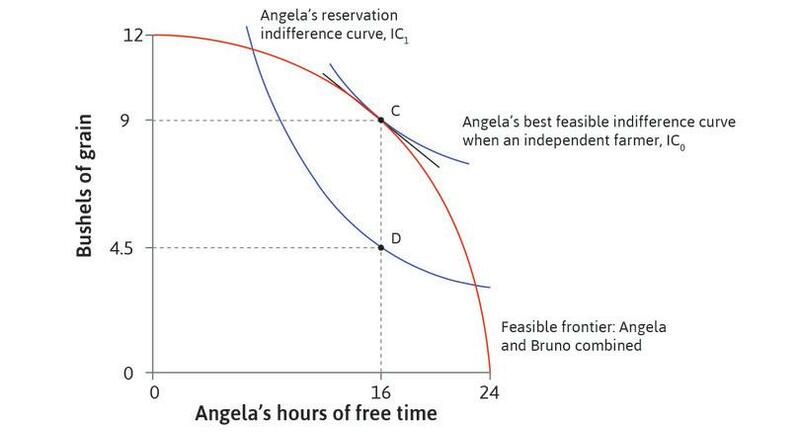 The set of points bounded by the reservation indifference curve and the feasible frontier is the set of all economically feasible allocations, now that Angela has to agree to the proposal that Bruno makes. Bruno thanks you for this handy new tool for figuring out the most he can get from Angela. The biological survival constraint and the reservation indifference curve have a common point (Z): at that point, Angela does no work and gets subsistence rations from the government. Other than that, the two curves differ. The reservation indifference curve is uniformly above the biological survival constraint. The reason, you explain to Bruno, is that however hard she works along the survival constraint, she barely survives; and the more she works the less free time she has, so the unhappier she is. Along the reservation indifference curve, by contrast, she is just as well off as at her reservation option, meaning that being able to keep more of the grain that she produces compensates exactly for her lost free time. 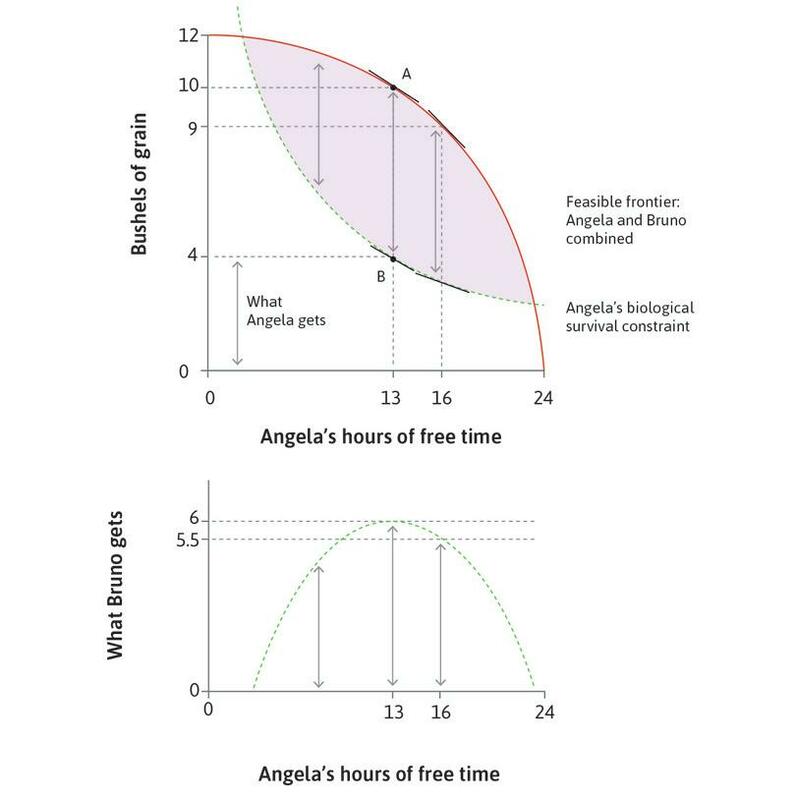 Explain why a point on the biological survival constraint is higher (more grain is required) when Angela has fewer hours of free time. Why does the curve also get steeper when she works more? Explain why the biologically feasible set is not equal to the economically feasible set. Explain (by shifting the curves) what happens if a more nutritious kind of grain is available for Angela to grow and consume. We can see that both Angela and Bruno may benefit if a deal can be made. Their exchange—allowing her to use his land (that is, not using his property right to exclude her) in return for her sharing some of what she produces—makes it possible for both to be better off than if no deal had been struck. As long as Bruno gets some of the crop he will do better than if there is no deal. As long as Angela’s share makes her better off than she would have been if she took her reservation option, taking account of her work hours, she will also benefit. This potential for mutual gain is why their exchange need not take place at the point of a gun, but can be motivated by the desire of both to be better off. All of the allocations that represent mutual gains are shown in the economically feasible set in Figure 5.6. Each of these allocations Pareto dominates the allocation that would occur without a deal. In other words, Bruno and Angela could achieve a Pareto improvement. This does not mean that both parties will benefit equally. If the institutions in effect give Bruno the power to make a take-it-or-leave-it offer, subject only to Angela’s agreement, he can capture the entire surplus (minus the tiny bit necessary to get Angela to agree). Bruno knows this already. Once you have explained the reservation indifference curve to him, Bruno knows which allocation he wants. He maximizes the amount of grain he can get at the maximum height of the lens-shaped region between Angela’s reservation indifference curve and the feasible frontier. This will be where the MRT on the feasible frontier is equal to the MRS on the indifference curve. 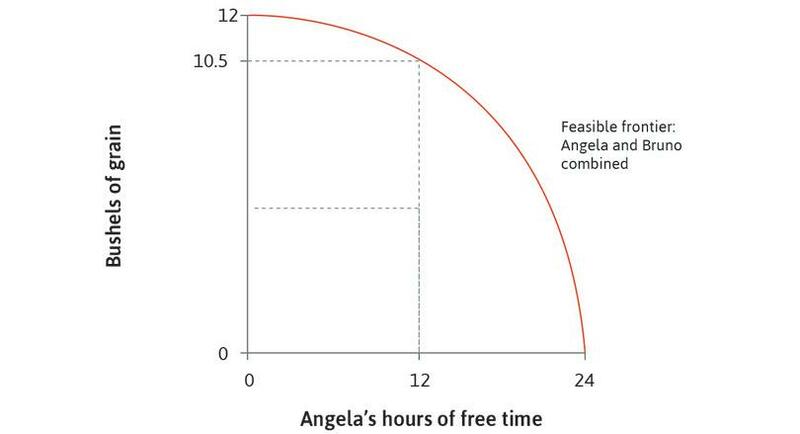 Figure 5.7a shows that this allocation requires Angela to work for fewer hours than she did under coercion. Bruno’s take-it-or-leave-it proposal when Angela can refuse. Figure 5.7a Bruno’s take-it-or-leave-it proposal when Angela can refuse. Using coercion, Bruno chose allocation B. He forced Angela to work 11 hours and received grain equal to AB. The MRT at A is equal to the MRS at B on Angela’s biological survival constraint. Figure 5.7a-a Using coercion, Bruno chose allocation B. He forced Angela to work 11 hours and received grain equal to AB. The MRT at A is equal to the MRS at B on Angela’s biological survival constraint. With voluntary exchange, allocation B is not available. The best that Bruno can do is allocation D, where Angela works for 8 hours, giving him grain equal to CD. Figure 5.7a-b With voluntary exchange, allocation B is not available. The best that Bruno can do is allocation D, where Angela works for 8 hours, giving him grain equal to CD. When Angela works 8 hours, the MRT is equal to the MRS on Angela’s reservation indifference curve, as shown by the slopes. Figure 5.7a-c When Angela works 8 hours, the MRT is equal to the MRS on Angela’s reservation indifference curve, as shown by the slopes. So Bruno would like Angela to work for 8 hours and give him 4.5 bushels of grain (allocation D). How can he implement this allocation? All he has to do is to make a take-it-or-leave-it offer of a contract allowing Angela to work the land, in return for a land rent of 4.5 bushels per day. (This is a sharecropping contract, in which a landowner allows a farmer to use land in return for a share of the crop.) If Angela has to pay 4.5 bushels (CD in Figure 5.7a) then she will choose to produce at point C, where she works for 8 hours. You can see this in the figure; if she produced at any other point on the feasible frontier and then gave Bruno 4.5 bushels, she would have lower utility—she would be below her reservation indifference curve. But she can achieve her reservation utility by working for 8 hours, so she will accept the contract. Angela’s income is the amount she produces minus the land rent she pays to Bruno. 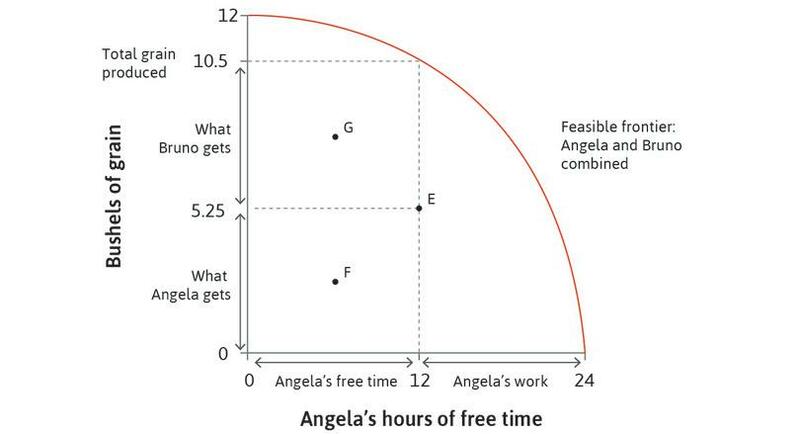 Using Figure 5.7a, suppose Angela works 11 hours. Would her income (after paying land rent) be greater or less than when she works 8 hours? Suppose instead, she works 6 hours, how would her income compare with when she works 8 hours? Explain in your own words why she will choose to work 8 hours. Since Angela is on her reservation indifference curve, only Bruno benefits from this exchange. All of the joint surplus goes to Bruno. His economic rent (equal to the land rent she pays him) is the surplus. Remember that when Angela could work the land on her own she chose allocation C. Notice now that she chooses the same hours of work when she has to pay rent. Why does this happen? However much rent Angela has to pay, she will choose her hours of work to maximize her utility, so she will produce at a point on the feasible frontier where the MRT is equal to her MRS. And we know that her preferences are such that her MRS doesn’t change with the amount of grain she consumes, so it will not be affected by the rent. This means that if she can choose her hours, she will work for 8 hours irrespective of the land rent (as long as this gives her at least her reservation utility). 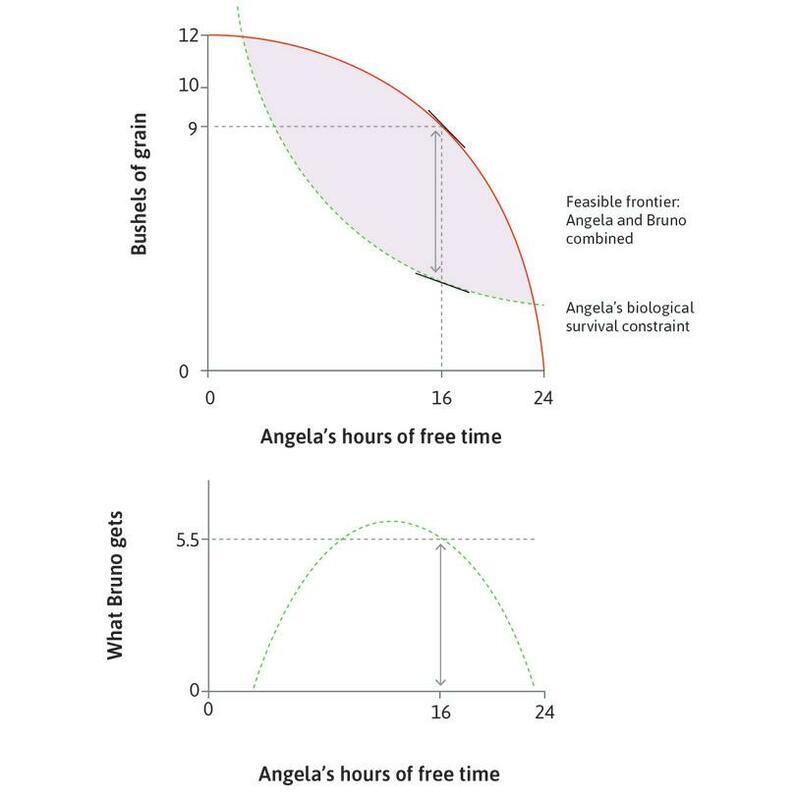 Figure 5.7b shows how the surplus (which Bruno gets) varies with Angela’s hours. You will see that the surplus falls as Angela works more or less than 8 hours. It is hump-shaped, like Bruno’s rent in the case of coercion. But the peak is lower when Bruno needs Angela to agree to the proposal. Figure 5.7b Bruno’s take-it-or-leave-it proposal when Angela can refuse. Using coercion, Angela was forced to work 11 hours. The MRT was equal to the MRS on Angela’s biological survival constraint. Figure 5.7b-a Using coercion, Angela was forced to work 11 hours. The MRT was equal to the MRS on Angela’s biological survival constraint. When Bruno cannot force Angela to work, he should offer a contract in which Angela pays him 4.5 bushels to rent the land. She works for 8 hours, where the MRT is equal to the MRS on her reservation indifference curve. Figure 5.7b-b When Bruno cannot force Angela to work, he should offer a contract in which Angela pays him 4.5 bushels to rent the land. She works for 8 hours, where the MRT is equal to the MRS on her reservation indifference curve. If Angela works more or less than 8 hours, the joint surplus is less than 4.5 bushels. Figure 5.7b-c If Angela works more or less than 8 hours, the joint surplus is less than 4.5 bushels. Although Bruno cannot coerce Angela he can get the whole surplus. Figure 5.7b-d Although Bruno cannot coerce Angela he can get the whole surplus. The peak of the hump is lower when Angela can refuse, compared to when Bruno could order her to work. Figure 5.7b-e The peak of the hump is lower when Angela can refuse, compared to when Bruno could order her to work. Exercise 5.8 Take it or leave it? Why is it Bruno, and not Angela, who has the power to make a take-it-or-leave-it offer? Can you imagine a situation in which the farmer, not the landowner, might have this power? 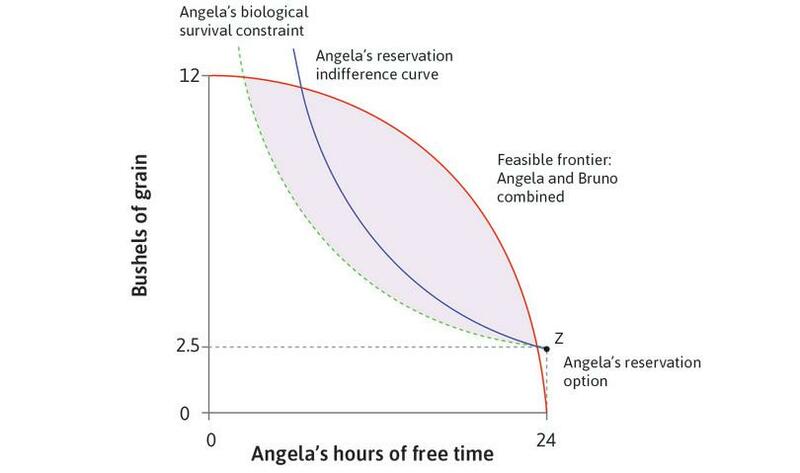 Figure 5.6 shows Angela and Bruno’s feasible frontier, Angela’s biological survival constraint, and her reservation indifference curve. The economically feasible set is the same as the technically feasible set. For any given number of hours of free time, the marginal rate of substitution on the reservation indifference curve is smaller than that on the biological survival constraint. Some points are economically feasible but not technically feasible. 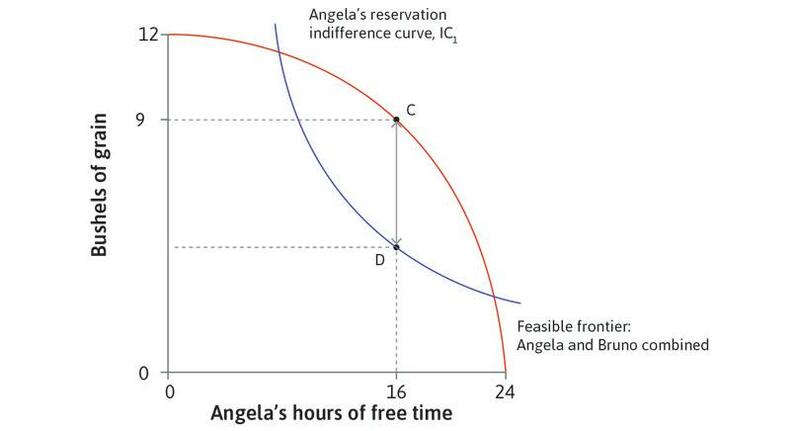 If the ration Angela gets from the government increases from 2 to 3 bushels of grain, her reservation indifference curve will be above her biological survival constraint whatever her working hours. The economically feasible set is the area between the reservation indifference curve and the feasible frontier. This is smaller than the technically feasible set, which is the area between the biological survival constraint and the feasible frontier. The reservation indifference curve is steeper than the biological survival constraint, in other words the MRS is larger on the former than on the latter. A point cannot be economically feasible if it is not technically feasible. The figure shows that the economically feasible set lies inside the technically feasible set. When the ration is 2 bushels, Angela’s reservation option is Z = (24, 2). If it increases to 3 bushels, her reservation option is (24, 3), which is on a higher indifference curve that lies above the survival constraint at all points. This will now be her reservation indifference curve. Figure 5.7a shows Angela and Bruno’s feasible frontier, Angela’s biological survival constraint and her reservation indifference curve. B is the outcome under coercion, while D is the outcome under voluntary exchange when Bruno makes a take-it-or-leave-it offer. With a take-it-or-leave-it offer, Bruno’s economic rent is equal to the joint surplus. Both Bruno and Angela are better off under voluntary exchange than under coercion. When Bruno makes a take-it-or-leave-it offer, Angela accepts because she receives an economic rent. Angela works longer under voluntary exchange than under coercion. Bruno’s reservation option is to receive nothing. Under voluntary exchange, Bruno receives the whole of the surplus: the amount in excess of what Angela needs to either survive or be willing to work. So this is his economic rent. Bruno’s amount of grain is the distance AB under coercion, and CD under voluntary exchange. So he is better off under coercion. Bruno offers an allocation Angela is only just willing to accept. She is indifferent between D and her reservation option, so her rent is zero. Angela will have more hours of free time at D under voluntary exchange than under coercion. Angela chose to work for 8 hours, producing 9 bushels of grain, both when she had to pay rent, and also when she did not. In both cases there is a surplus of 4.5 bushels: the difference between the amount of grain produced, and the amount that would give Angela her reservation utility. All the grain produced is shared between Angela and Bruno. The MRT on the feasible frontier is equal to the MRS on Angela’s indifference curve. This means that the allocations are Pareto efficient. To see why, remember that Pareto efficiency means that no Pareto improvement is possible: it is impossible to change the allocation to make one party better off without making the other worse off. The first property is straightforward: it means that no Pareto improvement can be achieved simply by changing the amounts of grain they each consume. If one consumed more, the other would have to have less. On the other hand, if some of the grain produced was not being consumed, then consuming it would make one or both of them better off. The second property, MRS = MRT, means that no Pareto improvement can be achieved by changing Angela’s hours of work and hence the amount of grain produced. If the MRS and MRT were not equal, it would be possible to make both better off. For example, if MRT > MRS, Angela could transform an hour of her time into more grain than she would need to get the same utility as before, so the extra grain could make both of them better off. But if MRT = MRS, then any change in the amount of grain produced would only be exactly what is needed to keep Angela’s utility the same as before, given the change in her hours. Figure 5.8 shows that there are many other Pareto-efficient allocations in addition to these two. Point C is the outcome when Angela is an independent farmer. Compare the analysis in Figure 5.8 with Bruno’s take-or-leave-it offer, and see the other Pareto-efficient allocations. Pareto-efficient allocations and the distribution of the surplus. Figure 5.8 Pareto-efficient allocations and the distribution of the surplus. As an independent farmer, Angela chose point C, where MRT = MRS. She consumed 9 bushels of grain: 4.5 bushels would have been enough to put her on her reservation indifference curve at D. But she obtained the whole surplus CD—an additional 4.5 bushels. Figure 5.8a As an independent farmer, Angela chose point C, where MRT = MRS. She consumed 9 bushels of grain: 4.5 bushels would have been enough to put her on her reservation indifference curve at D. But she obtained the whole surplus CD—an additional 4.5 bushels. When Bruno owned the land and made a take-it-or-leave-it offer, he chose a contract in which the land rent was CD (4.5 bushels). Angela accepted and worked 8 hours. The allocation was at D, and once again, MRT = MRS. The surplus was still CD, but Bruno got it all. Figure 5.8b When Bruno owned the land and made a take-it-or-leave-it offer, he chose a contract in which the land rent was CD (4.5 bushels). Angela accepted and worked 8 hours. The allocation was at D, and once again, MRT = MRS. The surplus was still CD, but Bruno got it all. Remember that Angela’s MRS doesn’t change as she consumes more grain. At any point along the line CD, such as G, there is an indifference curve with the same slope. So MRS = MRT at all of these points. Figure 5.8c Remember that Angela’s MRS doesn’t change as she consumes more grain. At any point along the line CD, such as G, there is an indifference curve with the same slope. So MRS = MRT at all of these points. Point G is a hypothetical allocation, at which MRS = MRT. Angela works for 8 hours, and 9 bushels of grain are produced. Bruno gets grain CG, and Angela gets all the rest. Allocation G is Pareto efficient. Figure 5.8d Point G is a hypothetical allocation, at which MRS = MRT. Angela works for 8 hours, and 9 bushels of grain are produced. Bruno gets grain CG, and Angela gets all the rest. Allocation G is Pareto efficient. All the points making up the line between C and D are Pareto-efficient allocations, at which MRS = MRT. The surplus of 4.5 bushels (CD) is shared between Angela and Bruno. Figure 5.8e All the points making up the line between C and D are Pareto-efficient allocations, at which MRS = MRT. The surplus of 4.5 bushels (CD) is shared between Angela and Bruno. A Pareto-efficient allocation has the property that there is no alternative technically feasible allocation in which at least one person would be better off, and nobody worse off. The set of all such allocations is the Pareto efficiency curve. It is also referred to as the contract curve. At each allocation on the Pareto efficiency curve Angela works for 8 hours and there is a surplus of 4.5 bushels, but the distribution of the surplus is different—ranging from point D where Angela gets none of it, to point C where she gets it all. At the hypothetical allocation G, both receive an economic rent: Angela’s rent is GD, Bruno’s is GC, and the sum of their rents is equal to the surplus. Figure 5.8 shows the Pareto efficiency curve CD for the interaction between Angela and Bruno. The allocation at C Pareto dominates the one at D.
Angela’s marginal rate of substitution is equal to the marginal rate of transformation at all points on the Pareto efficiency curve. The mid-point of CD is the most Pareto-efficient allocation. Angela and Bruno are indifferent between all the points on CD, because they are all Pareto efficient. The Pareto efficiency curve, by definition, joins all the economically feasible points where MRS = MRT. All the points on CD are Pareto efficient. It does not make any sense to say that one point on CD is more efficient than another. All the points on CD are Pareto efficient, but Bruno and Angela are not indifferent. Some points (like C) are better for Angela, while others (like D) are better for Bruno. Bruno thinks that the new rules, under which he makes an offer that Angela will not refuse, are not so bad after all. Angela is also better off than she had been when she had barely enough to survive. But she would like a share in the surplus. She and her fellow farm workers lobby for a new law that limits working time to 4 hours a day, while requiring that total pay is at least 4.5 bushels. They threaten not to work at all unless the law is passed. Angela, you and your colleagues are bluffing. No, we are not: we would be no worse off at our reservation option than under your contract, working the hours and receiving the small fraction of the harvest that you impose! Angela and her fellow workers win, and the new law limits the working day to 4 hours. Before the short-hours law Angela worked for 8 hours and received 4.5 bushels of grain. This is point D in Figure 5.9. The new law implements the allocation in which Angela and her friends work 4 hours, getting 20 hours of free time and the same number of bushels. Since they have the same amount of grain and more free time, they are better off. Figure 5.9 shows they are now on a higher indifference curve. The effect of an increase in Angela’s bargaining power through legislation. Figure 5.9 The effect of an increase in Angela’s bargaining power through legislation. Bruno makes a take-it-or-leave-it offer, gets grain equal to CD, and Angela works 8 hours. Angela is on her reservation indifference curve at D and MRS = MRT. Figure 5.9a Bruno makes a take-it-or-leave-it offer, gets grain equal to CD, and Angela works 8 hours. Angela is on her reservation indifference curve at D and MRS = MRT. Angela gets 4.5 bushels of grain: she is just indifferent between working for 8 hours and her reservation option. Figure 5.9b Angela gets 4.5 bushels of grain: she is just indifferent between working for 8 hours and her reservation option. With legislation that reduces work to 4 hours and keeps Angela’s amount of grain unchanged, she is on a higher indifference curve at F. Bruno’s grain is reduced from CD to EF (2 bushels). Figure 5.9c With legislation that reduces work to 4 hours and keeps Angela’s amount of grain unchanged, she is on a higher indifference curve at F. Bruno’s grain is reduced from CD to EF (2 bushels). When Angela works 4 hours, the MRT is larger than the MRS on the new indifference curve. 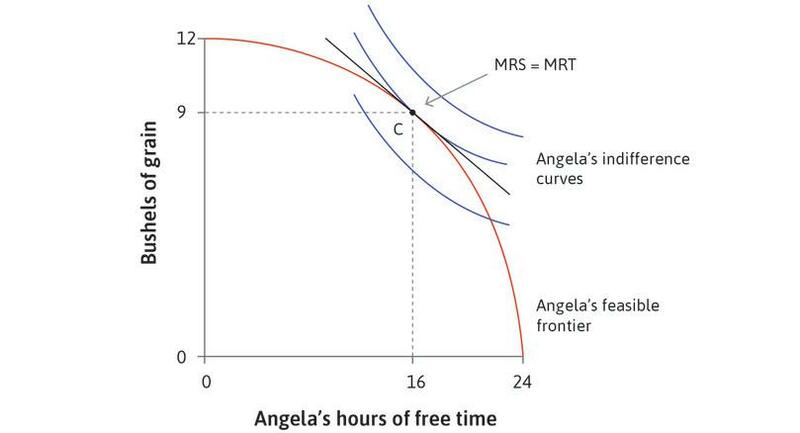 Figure 5.9d When Angela works 4 hours, the MRT is larger than the MRS on the new indifference curve. The new law has increased Angela’s bargaining power and Bruno is worse off than before. You can see she is better off at F than at D. She is also better off than she would be with her reservation option, which means she is now receiving an economic rent. The maximum amount of grain per year that Angela would give up to live under the new law rather than in the situation before the law was passed. Or (because Angela is obviously political) the amount she would be willing to pay so that the law passed, for example by lobbying the legislature or contributing to election campaigns. In Figure 5.9, D and F are the outcomes before and after the introduction of a new law that limits Angela’s work time to four hours a day while requiring a minimum pay of 4.5 bushels. Based on this information, which of the following statements are correct? The change from D to F is a Pareto improvement. The new outcome F is Pareto efficient. Both Angela and Bruno receive economic rents at F.
As a result of the new law, Bruno has less bargaining power. It is not a Pareto improvement, because Bruno is worse off (gets less grain) at F than at D.
At F, Angela is above her reservation indifference curve and is thus receiving an economic rent. Bruno’s reservation option is to receive nothing, so the grain he receives at F is an economic rent for him. At D, Bruno obtained rent equal to CD, and Angela obtained no rent. At F his rent is much lower. The law has increased Angela’s bargaining power and reduced Bruno’s. Angela and her friends are pleased with their success. She asks what you think of the new policy. Congratulations, but your policy is far from the best you could do. Because you are not on the Pareto efficiency curve! Under your new law, Bruno is getting 2 bushels, and cannot make you work more than 4 hours. So why don’t you offer to continue to pay him 2 bushels, in exchange for agreeing to let you keep anything you produce above that? Then you get to choose how many hours you work. The small print in the law allows a longer work day if both parties agree, as long as the workers’ reservation option is a 4-hour day if no agreement is reached. Now redraw Figure 5.9 and use the concepts of the joint surplus and the Pareto efficiency curve from Figure 5.8 to show Angela how she can get a better deal. Look at Figure 5.10. The surplus is largest at 8 hours of work. When you work for 4 hours the surplus is smaller, and you pay most of it to Bruno. If you increase the surplus, you can pay him the same amount, and your own surplus will be bigger—so you will be better off. Follow the steps in Figure 5.10 to see how this works. Bargaining to restore Pareto efficiency. Figure 5.10 Bargaining to restore Pareto efficiency. The surplus to be divided between Angela and Bruno is maximized where MRT = MRS, at 8 hours of work. Figure 5.10a The surplus to be divided between Angela and Bruno is maximized where MRT = MRS, at 8 hours of work. But Angela prefers point F implemented by the legislation, because it gives her the same amount of grain but more free time than D.
Figure 5.10b But Angela prefers point F implemented by the legislation, because it gives her the same amount of grain but more free time than D.
Compared to F, she would prefer any allocation on the Pareto efficiency curve between C and G.
Figure 5.10c Compared to F, however, she would prefer any allocation on the Pareto efficiency curve between C and G.
At allocation H, Bruno gets the same amount of grain: CH = EF. Angela is better off than she was at F. She works longer hours, but has more than enough grain to compensate her for the loss of free time. Figure 5.10d At allocation H, Bruno gets the same amount of grain: CH = EF. Angela is better off than she was at F. She works longer hours, but has more than enough grain to compensate her for the loss of free time. F is not Pareto efficient because MRT > MRS. If they move to a point on the Pareto efficiency curve between G and H, Angela and Bruno can both be better off. Figure 5.10e F is not Pareto efficient because MRT > MRS. If they move to a point on the Pareto efficiency curve between G and H, Angela and Bruno can both be better off. From D to F, the outcome is imposed by new legislation. This was definitely not win-win: Bruno lost because his economic rent at F is less than the maximum feasible rent that he got at D. Angela benefitted. Once at the legislated outcome, there were many win-win possibilities open to them. They are shown by the segment GH on the Pareto efficiency curve. Win-win alternatives to the allocation at F are possible by definition, because F was not Pareto efficient. Bruno wants to negotiate. He is not happy with Angela’s proposal of H.
I am no better off under this new plan than I would be if I just accepted the legislation that the farmers passed. But Bruno, Angela now has bargaining power, too. The legislation changed her reservation option, so it is no longer 24 hours of free time at survival rations. Her reservation option is now the legislated allocation at point F. I suggest you make her a counter offer. Angela, I’ll let you work the land for as many hours as you choose if you pay me half a bushel more than EF. They shake hands on the deal. Because Angela is free to choose her work hours, subject only to paying Bruno the extra half bushel, she will work 8 hours where MRT = MRS. Because this deal lies between G and H, it is a Pareto improvement over point F. Moreover, because it is on the Pareto-efficient curve CD, we know there are no further Pareto improvements to be made. This is true of every other allocation on GH—they differ only in the distribution of the mutual gains, as some favour Angela while others favour Bruno. Where they end up will depend on their bargaining power. In Figure 5.10, Angela and Bruno are at allocation F, where she receives 4.5 bushels of grain for 4 hours of work. All the points on EF are Pareto efficient. Any point in the area between G, H and F would be a Pareto improvement. Any point between G and D would be a Pareto improvement. They would both be indifferent between all points on GH. Along EF, MRS < MRT. So EF is not Pareto efficient—there are other allocations where both would be better off. In area GHF, Angela is on a higher indifference curve than IC2, and Bruno has more grain than EF, so both are better off. Points on GD are Pareto efficient, but below G, Angela is on a lower indifference curve than at F, so she would be worse off. Points on GH are all Pareto efficient, but Bruno and Angela are not indifferent. He prefers points nearer to G, and she prefers points nearer to H.
Angela’s farming skills and Bruno’s ownership of land provided an opportunity for mutual gains from exchange. The same is true when people directly exchange, or buy and sell, goods for money. Suppose you have more apples than you can consume, and your neighbour has an abundance of pears. The apples are worth less to you than to your neighbour, and the pears are worth more to you. So it must be pos­sible to achieve a Pareto improvement by exchanging some apples and pears. When people with differing needs, property and capacities meet, there is an opportunity to generate gains for all of them. That is why people come together in markets, online exchanges or pirate ships. The mutual gains are the pie—which we call the surplus. The allocations that we observe through history are largely the result of the institutions, including property rights and bargaining power, that were present in the economy. Figure 5.11 summarizes what we have learned about the determination of economic outcomes from the succession of scenarios involving Angela and Bruno. Technology and biology determine whether or not they are able to mutually benefit, and the technically feasible set of allocations (Section 5.5). If Bruno’s land had been so unproductive that Angela’s labour could not produce enough to keep her alive, then there would have been no room for a deal. For allocations to be economically feasible, they must be Pareto improvements relative to the parties’ reservation options, which may depend on institutions (such as Angela’s survival rations from the government (Section 5.7) or legislation on working hours (Section 5.10)). The outcome of an interaction depends on people’s preferences (what they want), as well as the institutions that provide their bargaining power (ability to get it), and hence how the surplus is distributed (Section 5.10). The fundamental determinants of economic outcomes. Figure 5.11 The fundamental determinants of economic outcomes. The story of Angela and Bruno provides three lessons about efficiency and fairness, illustrated by Figure 5.10, to which we will return in subsequent units. When one person or group has power to dictate the allocation, subject only to not making the other party worse off than in their reservation option, the powerful party will capture the entire surplus. If they have done this, then there cannot be any way to make either of them better off without making the other worse off (point D in the figure). So this must be Pareto efficient! Those who consider their treatment unfair often have some power to influence the outcome through legislation and other political means, and the result may be a fairer distribution in their eyes or ours, but may not necessarily be Pareto efficient (point F). Societies may face trade-offs between Pareto-efficient but unfair outcomes, and fair but Pareto-inefficient outcomes. If we have institutions under which people can jointly deliberate, agree on, and enforce alternative allocations, then it may be possible to avoid the trade-off and achieve both efficiency and fairness—as Angela and Bruno did through a combination of legislation and bargaining between themselves (point H). In our analysis of the interaction between Angela and Bruno, we have assessed the allocations in terms of Pareto efficiency. We have seen that they (or at least one of them) can be better off if they can negotiate a move from a Pareto-inefficient allocation to one on the Pareto efficiency curve. But the other important criterion for assessing an allocation is fairness. We know that Pareto-efficient allocations can be highly unequal. In the case of Angela and Bruno, inequality resulted directly from differences in bargaining power, but also from differences in their endowments: that is, what they each owned before the interaction (their initial wealth). Bruno owned land, while Angela had nothing except time and the capacity to work. Difference in endowments, as well as institutions, may in turn affect bargaining power. The Lorenz curve shows the entire population lined up along the horizontal axis from the poorest to the richest. The height of the curve at any point on the horizontal axis indicates the fraction of total income received by the fraction of the population given by that point on the horizontal axis. To see how this works, imagine a village in which there are 10 landowners, each owning 10 hectares, and 90 others who farm the land as sharecroppers, but who own no land (like Angela). The Lorenz curve is the blue line in Figure 5.12. Lining the population up in order of land ownership, the first 90% of the population own nothing, so the curve is flat. 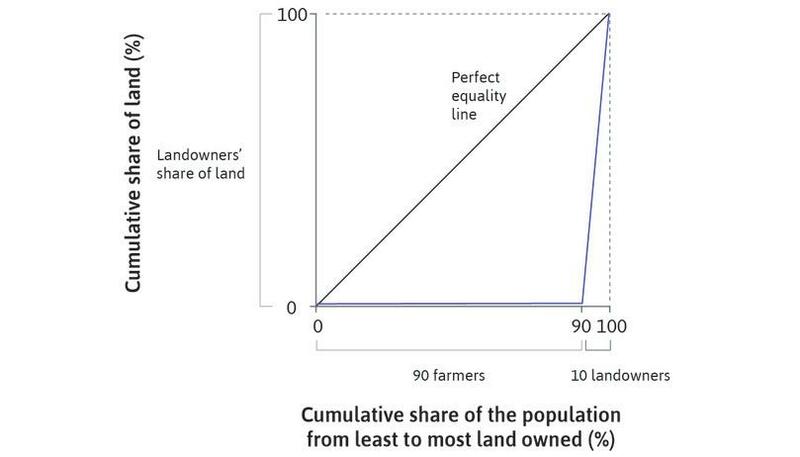 The remaining 10% own 10 hectares each, so the ‘curve’ rises in a straight line to reach the point where 100% of people own 100% of the land. A Lorenz curve for wealth ownership. Figure 5.12 A Lorenz curve for wealth ownership. 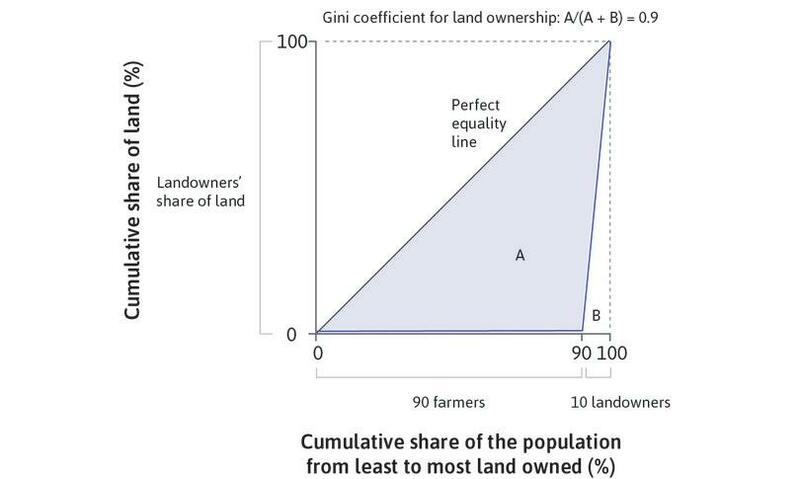 If instead each member of the population owned one hectare of land—perfect equality in land ownership—then the Lorenz curve would be a line at a 45-degree angle, indicating that the ‘poorest’ 10% of the population have 10% of the land, and so on (although in this case, everyone is equally poor, and equally rich). The Lorenz curve allows us to see how far a distribution departs from this line of perfect equality. 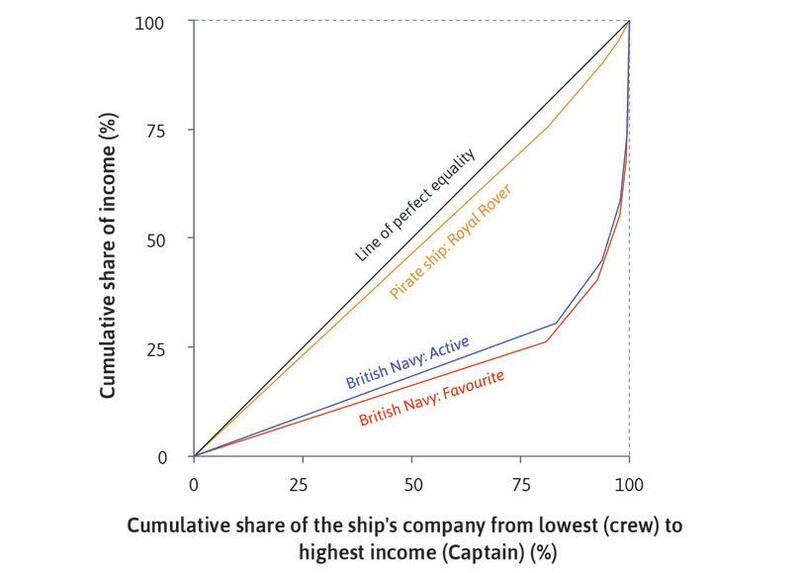 Figure 5.13 shows the distribution of income that would have resulted from the prize-sharing system described in the articles of the pirate ship, the Royal Rover, discussed in the introduction to this unit. The Lorenz curve is very close to the 45-degree line, showing how the institutions of piracy allowed ordinary members of the crew to claim a large share of income. In contrast, when the Royal Navy’s ships Favourite and Active captured the Spanish treasure ship La Hermione, the division of the spoils on the two British men-of-war ships was far less equal. The Lorenz curves show that ordinary crew members received about a quarter of the income, with the remainder going to a small number of officers and the captain. You can see that the Favourite was more unequal that the Active, with a lower share going to each crew member. By the standards of the day, pirates were unusually democratic and fair-minded in their dealings with each other. The distribution of spoils: Pirates and the Royal Navy. Figure 5.13 The distribution of spoils: Pirates and the Royal Navy. The Lorenz curve gives us a picture of the disparity of income across the whole population, but it can be useful to have a simple measure of the degree of inequality. You can see that more unequal distributions have a greater area between the Lorenz curve and the 45-degree line. The Gini coefficient (or Gini ratio) named after the Italian statistician Corrado Gini (1884–1965), is calculated as the ratio of this area to the area of the whole of the triangle under the 45-degree line. The Lorenz curve and Gini coefficient for wealth ownership. Figure 5.14a The Lorenz curve and Gini coefficient for wealth ownership. Figure 5.14b shows the Gini coefficients for each of the Lorenz curves we have drawn so far. Figure 5.14b Comparing Gini coefficients. Strictly speaking, this method of calculating the Gini gives only an approximation. 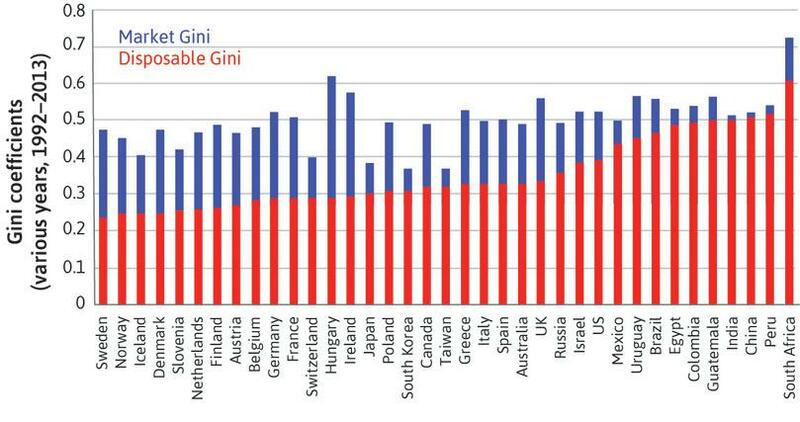 The Gini is more precisely defined as a measure of the average difference in income between every pair of individuals in the population, as explained in the Einstein at the end of this section. The area method gives an accurate approximation only when the population is large. In Unit 1, we compared inequality in the income distributions of countries using the 90/10 ratio. Lorenz curves give us a fuller picture of how distributions differ. Figure 5.15 shows the distribution of market income in the Netherlands in 2010. The Gini coefficient is 0.47, so by this measure it has greater inequality than the Royal Rover, but less than the British Navy ships. The analysis in Figure 5.15 shows how redistributive government policies result in a more equal distribution of disposable income. Distribution of market and disposable income in the Netherlands (2010). Figure 5.15 Distribution of market and disposable income in the Netherlands (2010). LIS. Cross National Data Center. Stefan Thewissen (University of Oxford) did the calculations in April 2015. The curve indicates that the poorest 10% of the population (10 on the horizontal axis) receive only 0.1% of total income (0.1 on the vertical axis), and the lower-earning half of the population has less than 20% of income. Figure 5.15a The curve indicates that the poorest 10% of the population (10 on the horizontal axis) receive only 0.1% of total income (0.1 on the vertical axis), and the lower-earning half of the population has less than 20% of income. LIS. Cross National Data Center. Stefan Thewissen (University of Oxford) did the calculations in April 2015. Household market (labour and capital) income and disposable income are equivalized and top- and bottom-coded. 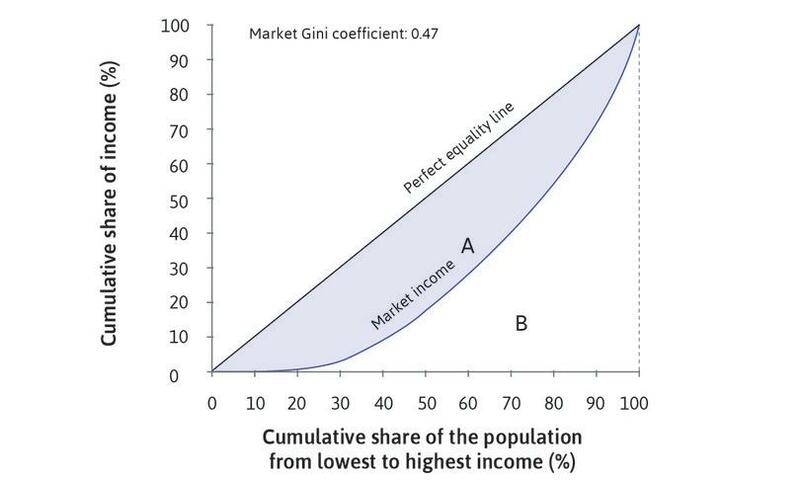 The Gini coefficient is the ratio of area A (between the market income curve and the perfect equality line) to area A + B (below the perfect equality line), which is 0.47. 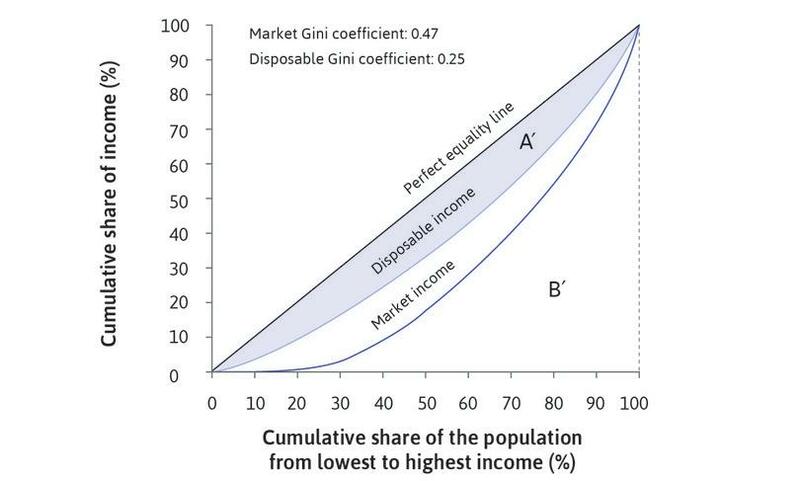 Figure 5.15b The Gini coefficient is the ratio of area A (between the market income curve and the perfect equality line) to area A + B (below the perfect equality line), which is 0.47. The amount of inequality in disposable income is much smaller than the inequality in market income. Redistributive policies have a bigger effect towards the bottom of the distribution. The poorest 10% have 4% of total disposable income. Figure 5.15c The amount of inequality in disposable income is much smaller than the inequality in market income. Redistributive policies have a bigger effect towards the bottom of the distribution. The poorest 10% have 4% of total disposable income. 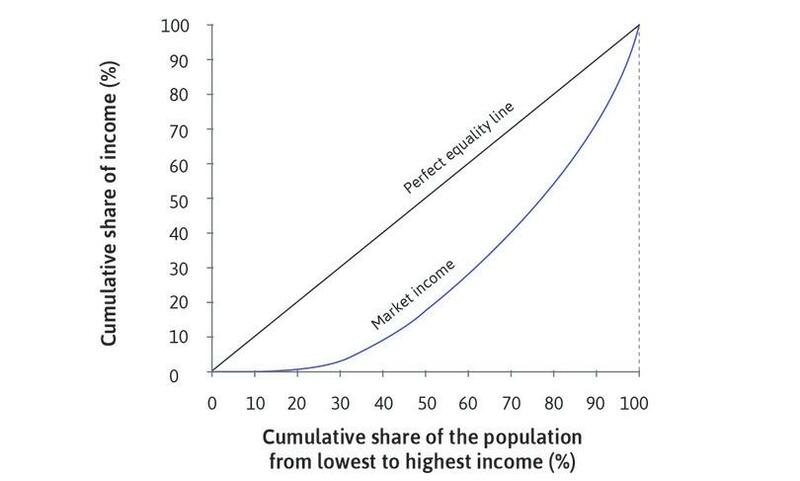 The Gini coefficient for disposable income is lower: the ratio of areas A′ (between the disposable income curve and the perfect equality line) and A′ + B′ (below the perfect equality line) is 0.25. Figure 5.15d The Gini coefficient for disposable income is lower: the ratio of areas A′ (between the disposable income curve and the perfect equality line) and A′ + B′ (below the perfect equality line) is 0.25. Notice that in the Netherlands, almost one-fifth of the households have a near-zero market income, but most nonetheless have enough disposable income to survive, or even live comfortably: the poorest one-fifth of the population receive about 10% of all disposable income. There are many different ways to measure income inequality besides the Gini and the 90/10 ratio, but these two are widely used. Figure 5.16 compares the Gini coefficients for disposable and market income across a large sample of countries, ordered from left to right, from the least to the most unequal by the disposable income measure. The main reason for the substantial differences between nations in disposable income inequality is the extent to which governments can tax well off families and transfer the proceeds to the less well off. The differences between countries in disposable income inequality (the top of the lower bars) are much greater than the differences in inequality of market incomes (the top of the upper bars). The US and the UK are among the most unequal of the high-income economies. … (with the exception of South Africa) this is mainly the result of the limited degree of redistribution from rich to poor, rather than unusually high inequality in market income. We study redistribution of income by governments in more detail in Unit 19 (Inequality). Income inequality in market and disposable income across the world. Figure 5.16 Income inequality in market and disposable income across the world. Figure 5.15 shows the Lorenz curve for market income in the Netherlands in 2010. If area A increases, income inequality falls. The Gini coefficient can be calculated as the proportion of area A to area A + B. Countries with lower Gini coefficients have less equal income distributions. The Gini coefficient takes the value 1 when everyone has the same income. If area A increases, then inequality (as measured by the Gini coefficient) rises. This method can be used when the population is large, as it is for a whole country such as the Netherlands. Countries with lower Gini coefficients have lower inequality (by this measure) hence a more equal income distribution. The coefficient takes the value zero when all have the same income (the Lorenz curve is on the perfect equality line). The table shows three alternative distributions of land ownership in a village with 100 people and 100 hectares of land. Draw the Lorenz curves for each case. For cases I and III calculate the Gini. For case II, show on the Lorenz curve diagram how the Gini coefficient can be calculated. Find the difference in income between every possible pair in the population. Take the mean of these differences. Divide this number by the mean income of the population, to get the relative mean difference. g = relative mean difference divided by two. There are just two individuals in the population and one has all the income. Assume their incomes are 0 and 1. The difference between the incomes of the pair = 1. This is the mean difference because there is just one pair. Mean income = 0.5, so the relative mean difference = 1/0.5 = 2.
g = 2/2 = 1 (perfect inequality, as we would expect). Two people are dividing a pie: one has 20%, and the other 80%. The difference is 60% (0.60). This is the mean difference (there are only two incomes, as before). Mean income is 50% or 0.50. The relative mean difference is 0.6/0.5 = 1.20. The Gini coefficient is a measure of how unequal their slices are. As an exercise, confirm that if the size of the smaller slice of the pie is σ, g = 1 − 2σ. There are three people, and one has all of the income, which we assume is 1 unit. The differences for the three possible pairs are 1, 1, and 0. Relative mean difference = (2/3)/(1/3) = 2.
g = 2/2 = 1. If the population is large, we obtain a good approximation to the Gini coefficient using the areas in the Lorenz diagram: g ≈ A/(A + B). But with a small number of people, this approximation is not accurate. You can see this if you think about the case of ‘perfect inequality’ when one individual gets 100% of the income, for which the true Gini is 1, whatever the size of the population (we calculated it for populations of 2 and 3 above). The Lorenz curve is horizontal at zero up to the last individual, and then shoots up to 100%. Try drawing the Lorenz curves when the size of the population, N, is 2, 3, 10, and 20. When N = 2 , A/(A + B) = 0.5, a very poor approximation to the true value, g = 1. When N is large, area A is not quite as big as area A + B, but the ratio is almost 1. Angela and Bruno live in the hypothetical world of an economic model. But real farmers and landowners face similar problems. In the Indian state of West Bengal, home to more people than Germany, many farmers work as sharecroppers (bargadars in the Bengali language), renting land from landowners in exchange for a share of the crop. The traditional contractual arrangements throughout this vast state varied little from village to village, with virtually all bargadars giving half their crop to the landowner at harvest time. This had been the norm since at least the eighteenth century. But, like Angela, in the second half of the twentieth century many thought this was unfair, because of the extreme levels of deprivation among the bargadars. In 1973, 73% of the rural population lived in poverty, one of the highest poverty rates in India. In 1978, the newly elected Left Front government of West Bengal adopted new laws, called Operation Barga. Bargadars could keep up to three-quarters of their crop. Bargadars were protected from eviction by landowners, provided they paid them the 25% quota. Bargadars had a greater incentive to work hard and well: Keeping a larger share meant that there was a greater reward if they grew more crops. Bargadars had an incentive to invest in improving the land: They were confident that they would farm the same plot of land in the future, so would be rewarded for their investment. Figure 5.17 summarizes the concepts developed in this unit that we can use to judge the impact of an economic policy. Having gathered evidence to describe the resulting allocation, we ask: is it Pareto efficient, and fair? Is it better than the original allocation by these criteria? Figure 5.17 Efficiency and fairness. The evidence that Operation Barga increased incomes indicates that the pie got larger, and the poorest people got a larger slice. In principle, the increase in the size of the pie means there could be mutual gains from the reforms, with both farmers and landowners made better off. However, the actual change in the allocation was not a Pareto improvement. The incomes of some landowners fell following the reduction in their share of the crop. Nevertheless, in increasing the income of the poorest people in West Bengal, we might judge that Operation Barga was fair. We can assume that many people in West Bengal thought so, because they continued to vote for the Left Front alliance. It stayed in power from 1977 until 2011. We do not have detailed information for Operation Barga, but we can illustrate the effect of the land reform on the distribution of income in the hypothetical village of the previous section, with 90 sharecroppers and 10 landowners. Figure 5.18 shows the Lorenz curves. Initially, the farmers pay a rent of 50% of their crop to the landowners. Operation Barga raises the farmer’s crop share to 75%, moving the Lorenz curve towards the 45-degree line. As a result, the Gini coefficient of income is reduced from 0.4 (similar to the US) to 0.15 (well below that of the most equal of the rich economies, such as Denmark). The Einstein at the end of this section shows you how the Gini coefficient depends on the proportion of farmers and their crop share. Bargaining in practice: How a land tenure reform in West Bengal reduced the Gini coefficient. 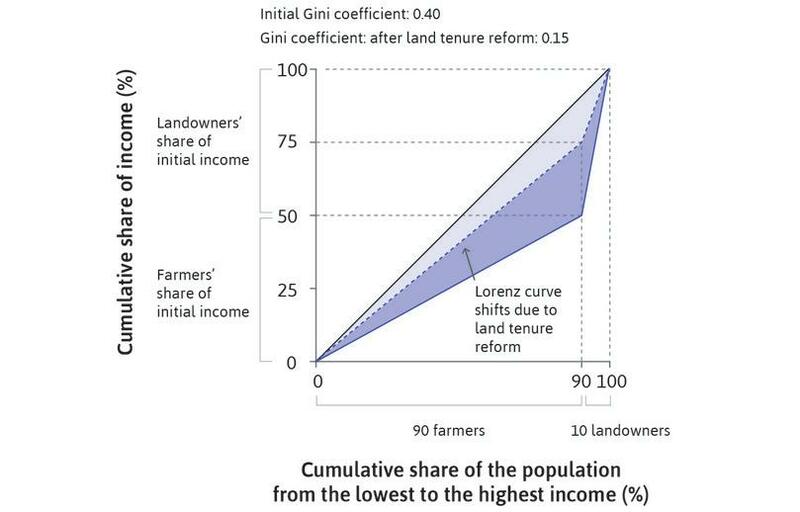 Figure 5.18 Bargaining in practice: How a land tenure reform in West Bengal reduced the Gini coefficient. Think about a population of 100 people in which a fraction n produce the output, and the others are employers (or landlords, or other claimants on income who are not producers). Take, as an example, the farmers and landlords in the text (in West Bengal). 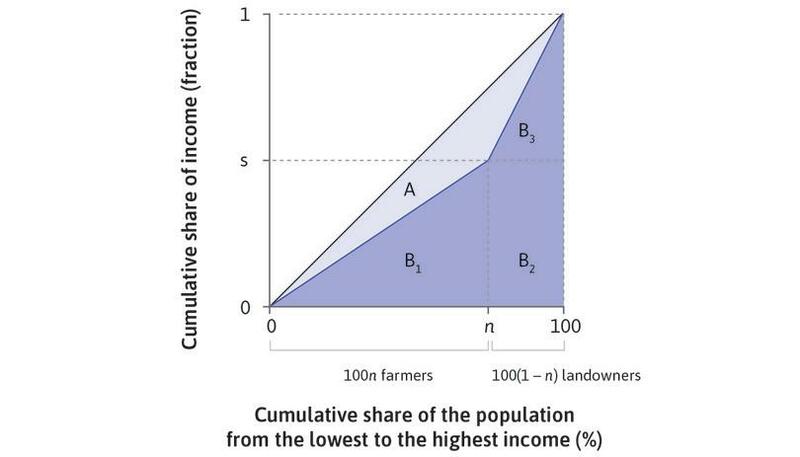 Each of the n × 100 farmers produces q and he or she receives a fraction, s, of this; so each of the farmers has income sq. The (1 − n) × 100 employers each receive an income of (1 − s)q. The figure below presents the Lorenz curve and the perfect equality line similar to Figure 5.18 in the text. Figure 5.19 The Lorenz curve and the perfect equality line. The slope of the line separating area A from B1 is s/n (the fraction of total output that each farmer gets), and the slope of the line separating area A from B3 is (1 − s)/(1 − n), the fraction of total output that each landlord gets. We can approximate the Gini coefficient by the expression A/(A + B), where in the figure B = B1 + B2 + B3. This means that the Gini coefficient in this simple case is just the fraction of the total population producing the output (the farmers) minus the fraction of the output that they receive in income. The fraction of producers in the economy increases but the total share of output they receive remains unchanged. This would be the case if some of the landlords became farmer tenants, each receiving a fraction s of the crop they produced. The fraction of the crop received by the producers falls. Economic interactions are governed by institutions, which specify the rules of the game. To understand the possible outcomes, we first consider what allocations are technically feasible, given the limits imposed by biology and technology. Then, if participation is voluntary, we look for economically feasible allocations: those which could provide mutual gains (a surplus), and therefore are Pareto-improving relative to the reservation positions of the parties involved. Which feasible allocation will arise depends on the bargaining power of each party, which determines how a surplus will be shared and in turn depends on the institutions governing the interaction. We can evaluate and compare allocations using two important criteria for judging economic interactions: fairness and Pareto efficiency. Leeson, Peter T. 2007. ‘An–arrgh–chy: The Law and Economics of Pirate Organization’. Journal of Political Economy 115 (6): pp. 1049–94. Lorenz, Max O. 1905. ‘Methods of Measuring the Concentration of Wealth’. Publications of the American Statistical Association 9 (70). Pareto, Vilfredo. 2014. Manual of political economy: a variorum translation and critical edition. Oxford, New York, NY: Oxford University Press. Raychaudhuri, Ajitava. 2004. Lessons from the Land Reform Movement in West Bengal, India. Washington, DC: World Bank.